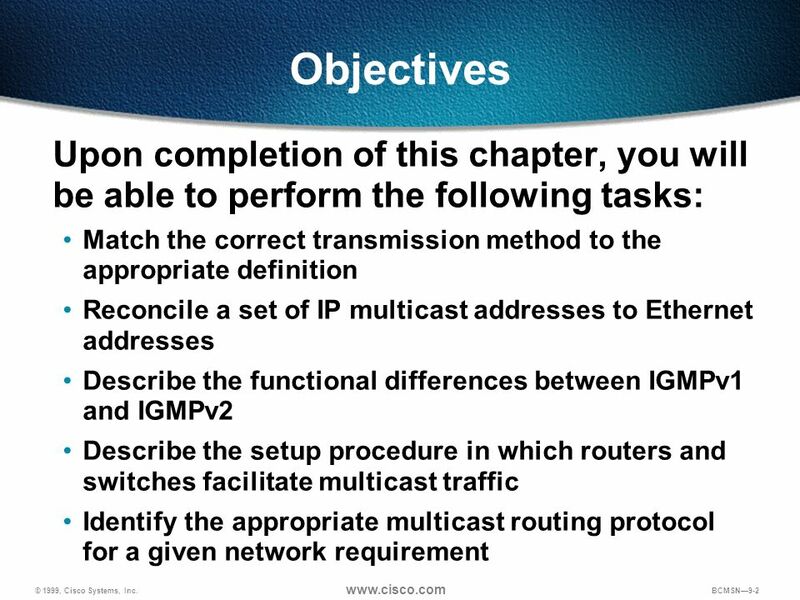 2 Objectives Upon completion of this chapter, you will be able to perform the following tasks: Match the correct transmission method to the appropriate definition Reconcile a set of IP multicast addresses to Ethernet addresses Describe the functional differences between IGMPv1 and IGMPv2 Describe the setup procedure in which routers and switches facilitate multicast traffic Identify the appropriate multicast routing protocol for a given network requirement Purpose: This graphic states the chapter objectives. Emphasize: Read or state each objective so each student has a clear understanding of the chapter objectives. At the end of this chapter, the students will be able to: Given a list of transmission characteristics, match the correct transmission method to appropriate definition. 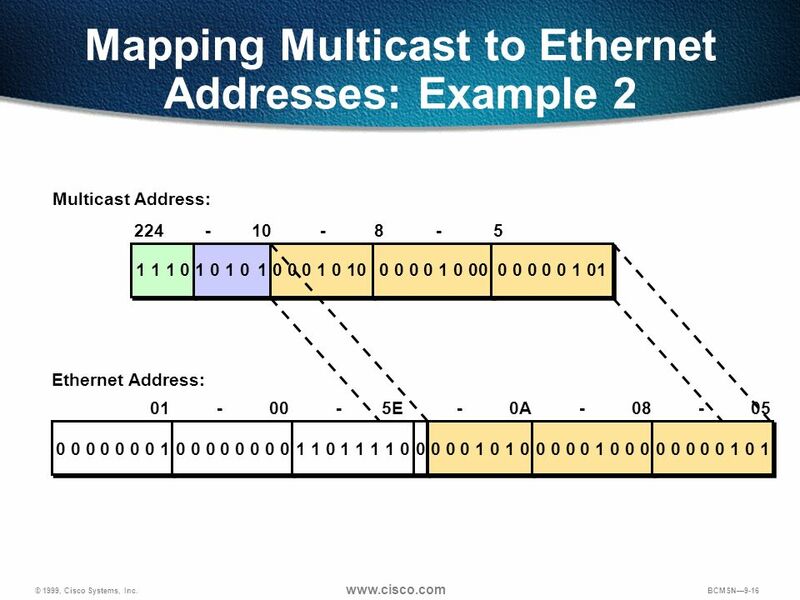 Given a list of multicast IP addresses, correctly reconcile them to Ethernet addresses. Given a set of multicast operations, place each step in the correct order of occurrence. Given a set of network requirements, select the appropriate multicast routing protocol. 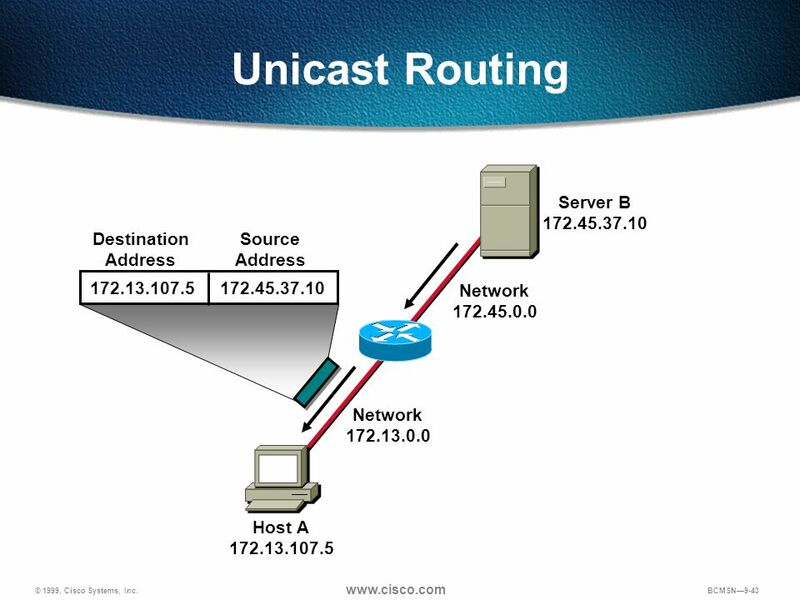 Given a list of multicast routing protocols, identify the correct multicast forwarding technique used for each one. 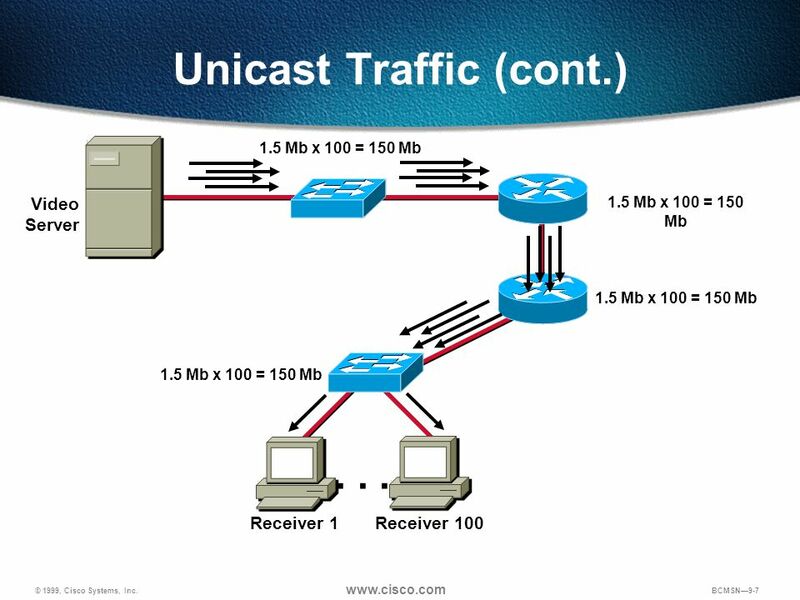 Transition: The following is a definition of a unicast traffic. 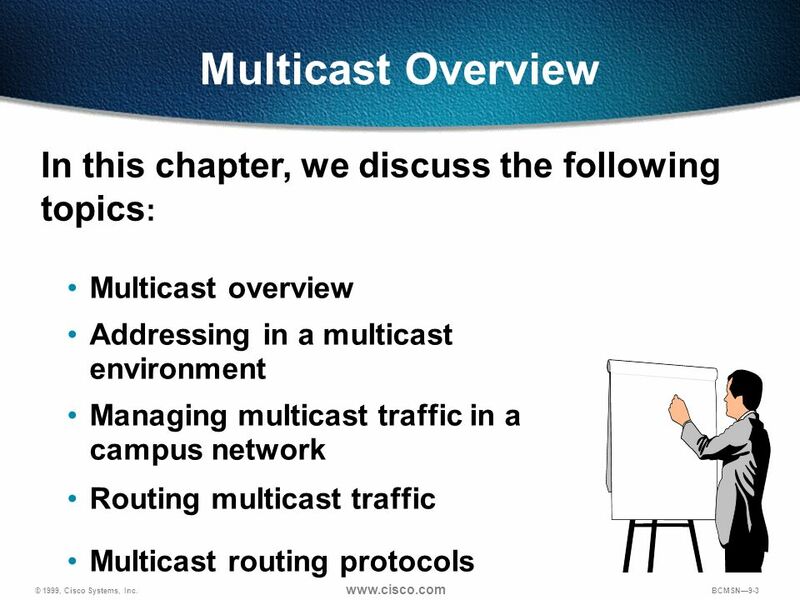 Addressing in a multicast environment Managing multicast traffic in a campus network Routing multicast traffic Multicast routing protocols Purpose: This graphic lists the chapter topics. Emphasize: Read or state each topic so students have a clear understanding of them. Transition: The following begins a discussion of different transmission types. 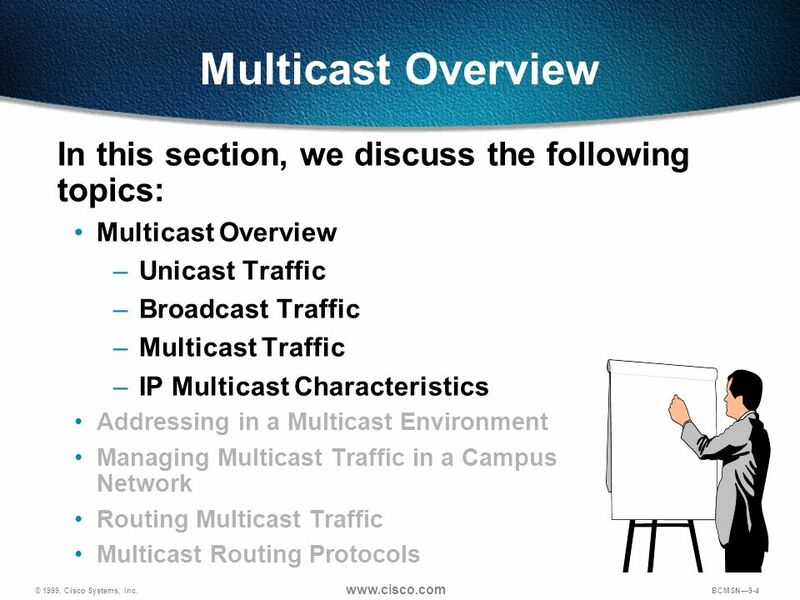 Unicast Traffic Broadcast Traffic Multicast Traffic IP Multicast Characteristics Addressing in a Multicast Environment Managing Multicast Traffic in a Campus Network Routing Multicast Traffic Multicast Routing Protocols Purpose: This graphic states the section topics. Emphasize: Read or state each topic so each student has a clear understanding of the what is covered in this section. Transition: The following begins the discussion on the different transmission types. The multicast server does not know the unicast network address of any particular recipient of the transmission. All recipients share the same multicast network address. 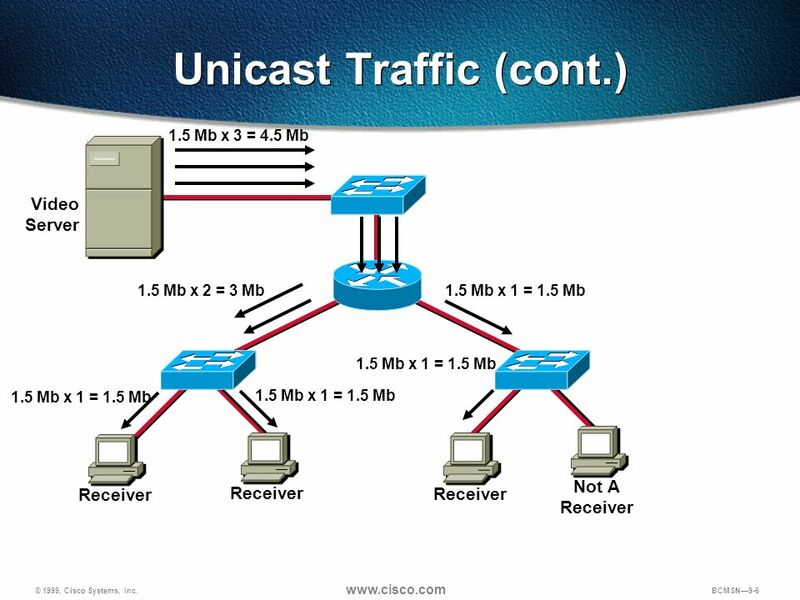 Multicast traffic is handled at the transport layer using the User Datagram Protocol (UDP). Unlike the Transmission Control Protocol (TCP), UDP adds no reliability, flow control, or error recovery functions to IP. Because of the simplicity of UDP, data packet headers contain fewer bytes and consume less network overhead than TCP. Transition: The following is the signpost for the next section. 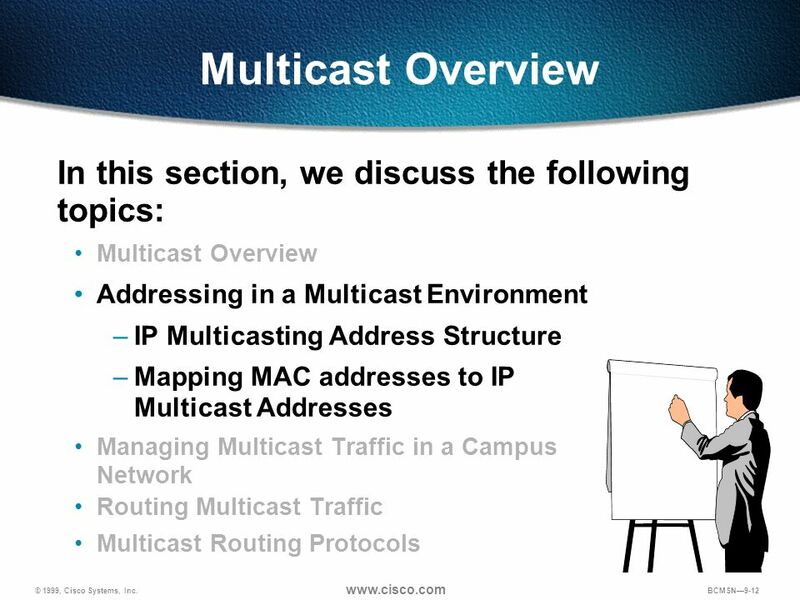 Addressing in a Multicast Environment IP Multicasting Address Structure Mapping MAC addresses to IP Multicast Addresses Managing Multicast Traffic in a Campus Network Routing Multicast Traffic Multicast Routing Protocols Purpose: This graphic states the section topics. Emphasize: Read or state each topic so each student has a clear understanding of what is covered in this section. 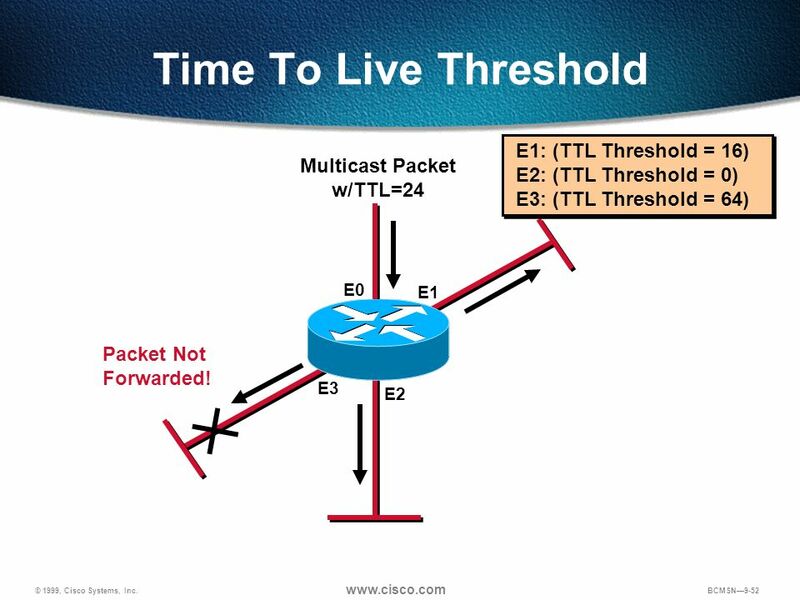 Transition: The following begins the discussion of how multicast addressing is structured. 28 bits Class D 1 1 1 Multicast Group ID A Class D address consists of 1110 as the higher order bits in the first octet, followed by a 28-bit group address. Class D addresses range from through The high-order bits in the first octet identify this 224-base address. 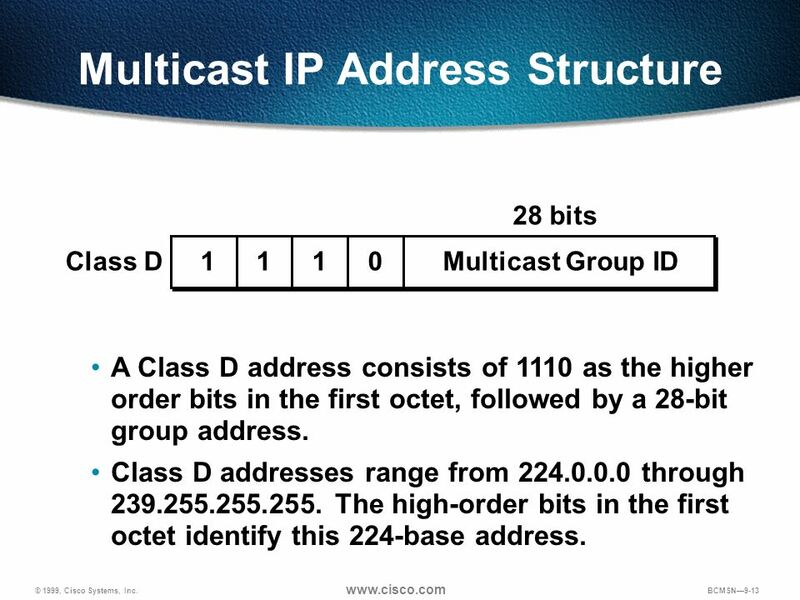 Purpose: This graphic shows how a multicast address is structured. Emphasize: The only difference between a multicast IP packet and a unicast IP packet is the presence of a group address in the destination address field of the IP header. The IP multicast datagram contains a specific combination of the destination Media Access Control (MAC) address and a destination IP address. 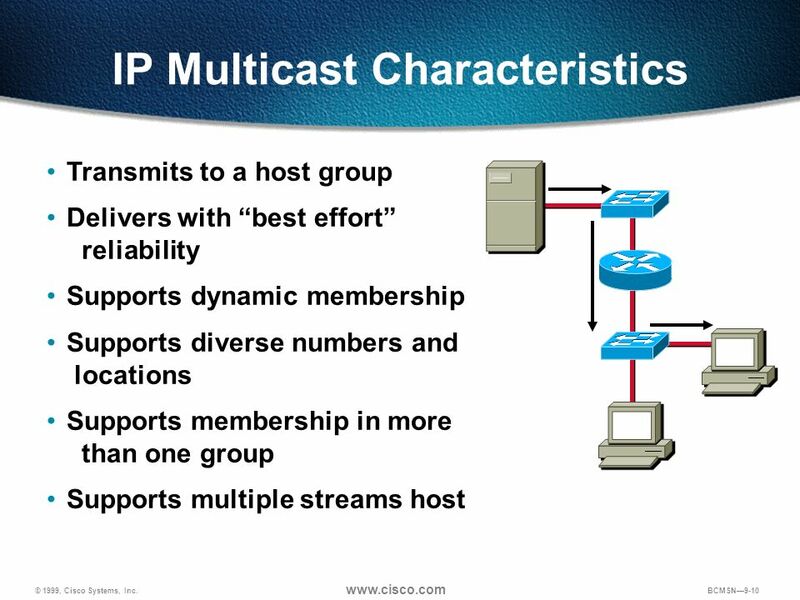 IP multicast uses Class D addresses. The last 28 bits of the Class D address are unstructured.These 28 bits of the IP address identify the multicast group ID. Multicast addresses are denoted in decimal numbers in the range of through Multicast addresses may be dynamically or statically allocated. Dynamic multicast addresses are requested on an as-needed basis. Statically allocated addresses are reserved for specific protocols that require well-known addresses. Refer to the table in the Student Guide for some of the well-known Class D addresses. 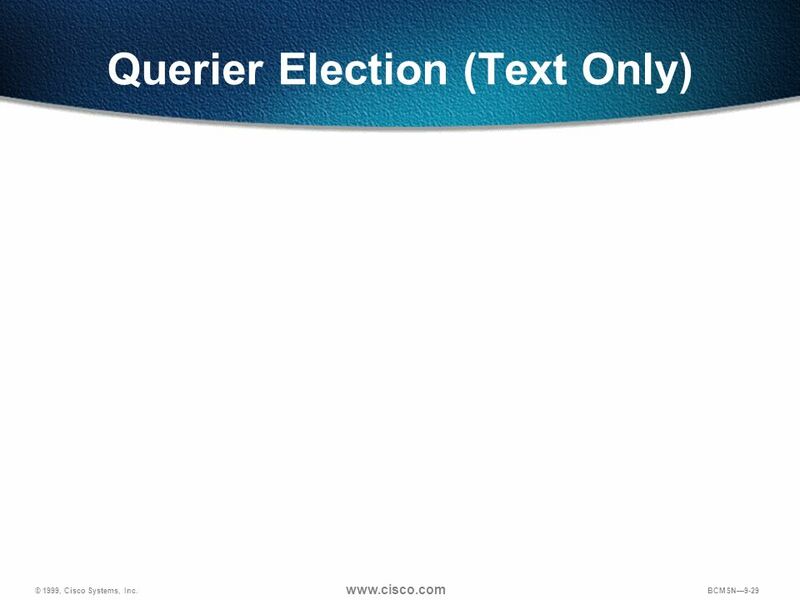 Refer to the document, Internet Multicast Addresses, at ftp://ftp.isi.edu/in-notes/iana/assignments or for the complete list of well-known addresses. Transition: The following is a discussion on mapping IP multicast addresses to Ethernet addresses. 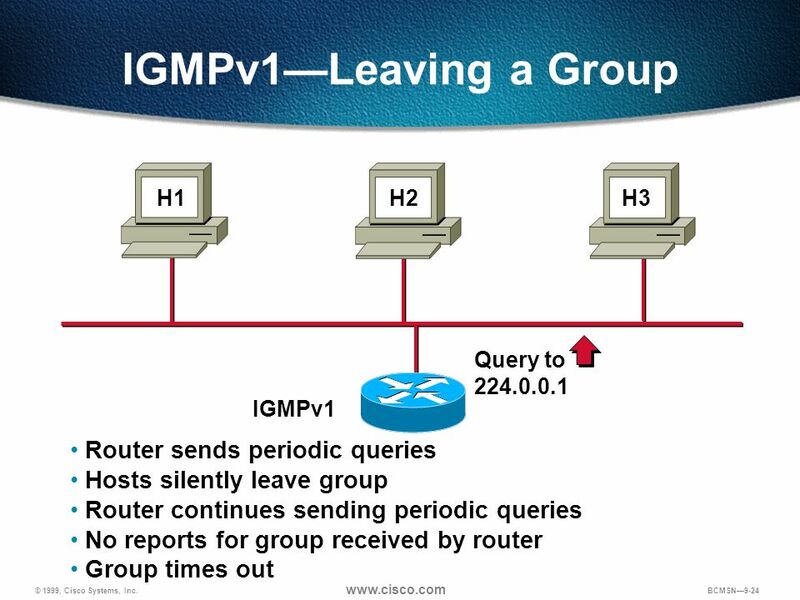 Addressing in a Multicast Environment Managing Multicast Traffic in a Campus Network Subscribing and Maintaining Groups IGMPv1 IGMPv2 Handling Multicast Traffic in the Switch Routing Multicast Traffic Multicast Routing Protocols Purpose: This graphic states the section topics. Emphasize: Read or state each objective so each student has a clear understanding of the module objectives. 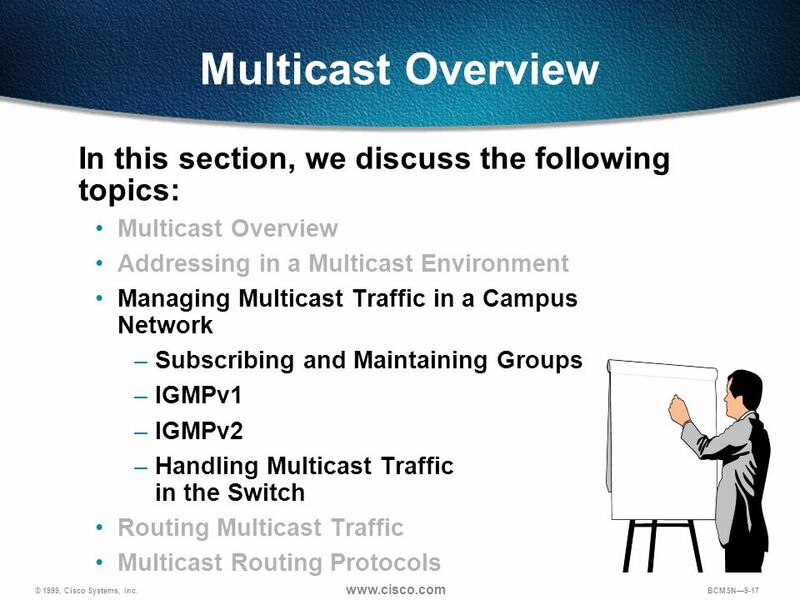 Transition: The following is a a discussion on managing multicast traffic in a campus network. 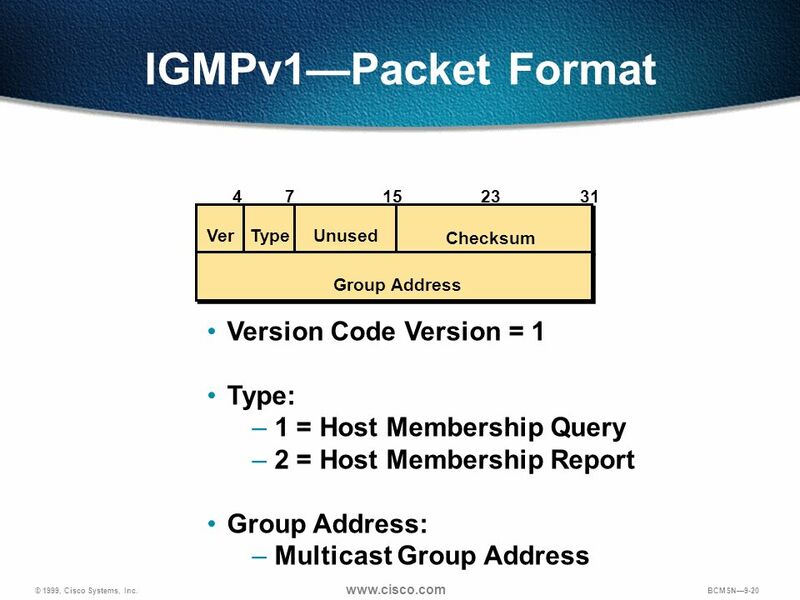 4 7 15 23 31 Ver Type Unused Checksum Group Address Version Code Version = 1 Type: 1 = Host Membership Query 2 = Host Membership Report Group Address: Multicast Group Address Purpose: This graphic introduces the IGMPv1 packet structure. 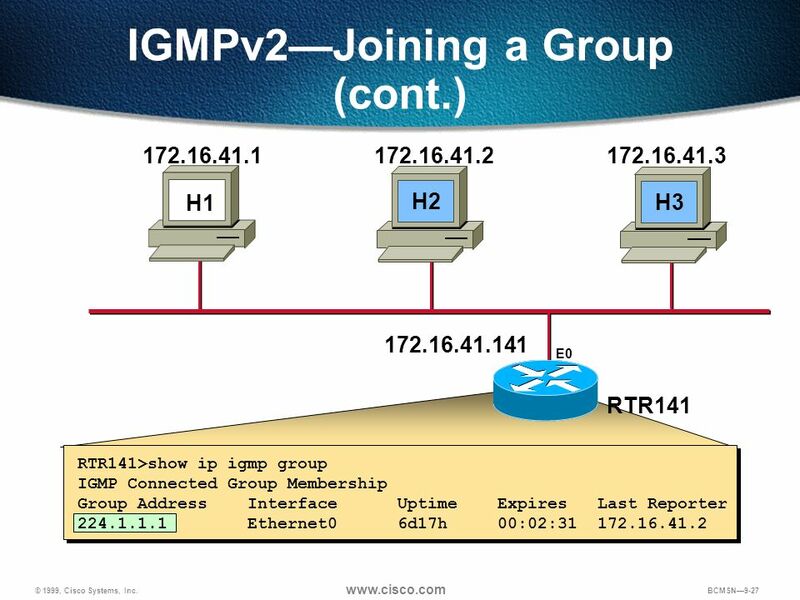 Emphasize: The Version field is the IGMP version and should be “0x1” in IGMPv1. This field has been merged with the Type field in IGMPv2 and eliminated. The Type field contains IGMP message type. 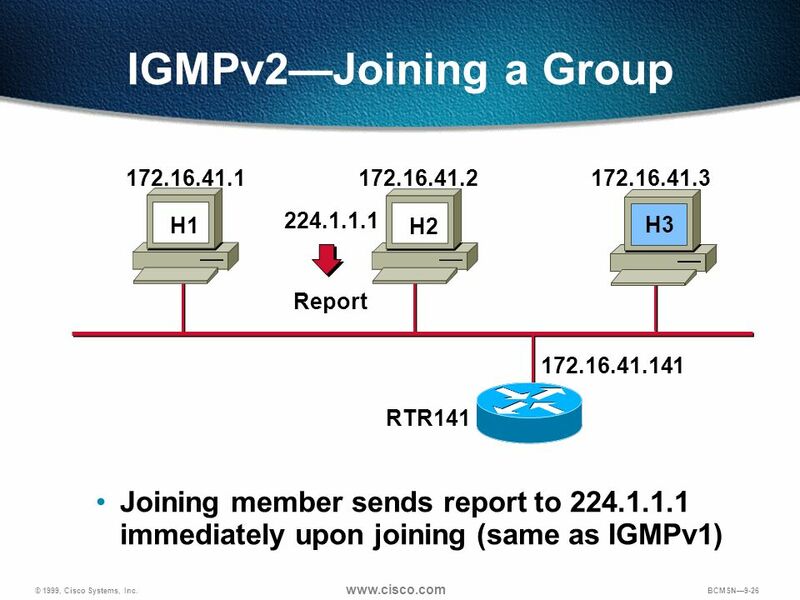 0x1 = Host membership query 0x2 = Host membership report This field has been expanded into an 8-bit field in IGMPv2. 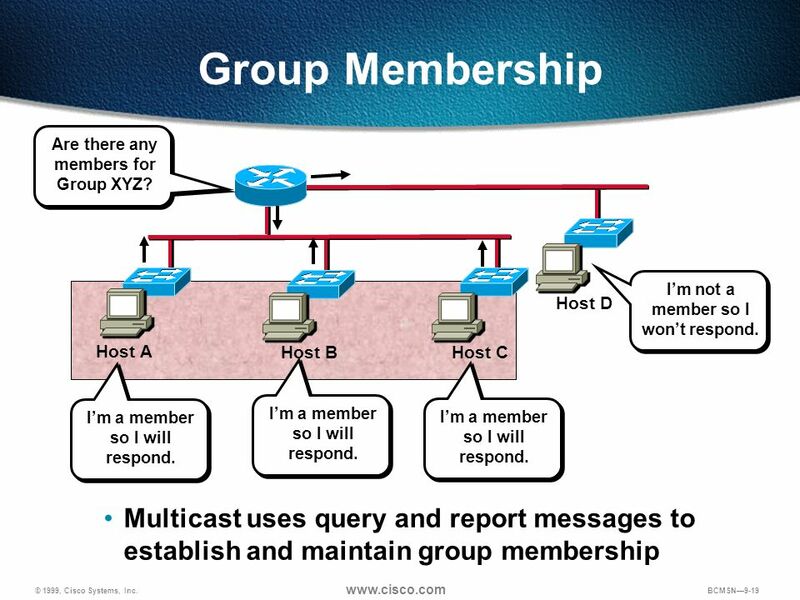 The Group field is the multicast group address being specified for reports. Transition: The following begins the discussion of IGMPv1. 7 15 31 Type Max. Resp. Time Checksum Group Address Multiple message types Max. Resp. Time Max. 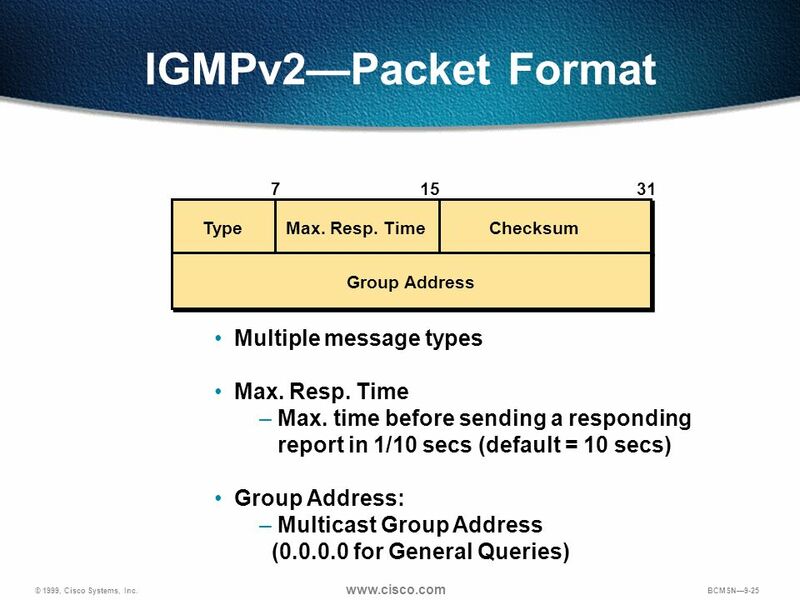 time before sending a responding report in 1/10 secs (default = 10 secs) Group Address: Multicast Group Address ( for General Queries) Purpose: This graphic shows the IGMPv2 packet format. Emphasize: In IGMPv2, the old 4-bit Version field was merged with the old 4-bit Type field to create a new 8-bit Type field. 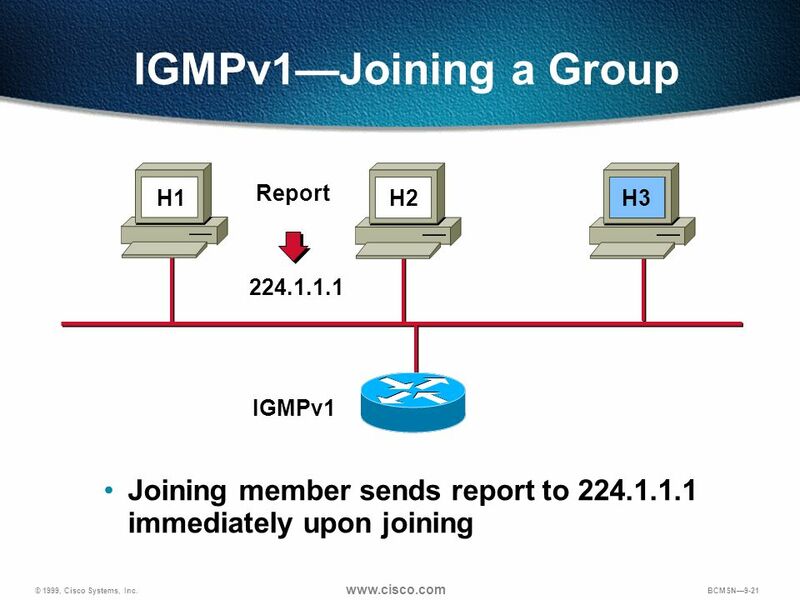 By assigning IGMPv2 type codes 0x11 and 0x12 as the membership query (V1 and V2) and the V1 membership report respectively, backwards compatibility of IGMP v1 and v2 packet formats was maintained. The Max Response field is a new field which allows the querying router to specify exactly what the query interval response time is for this query. 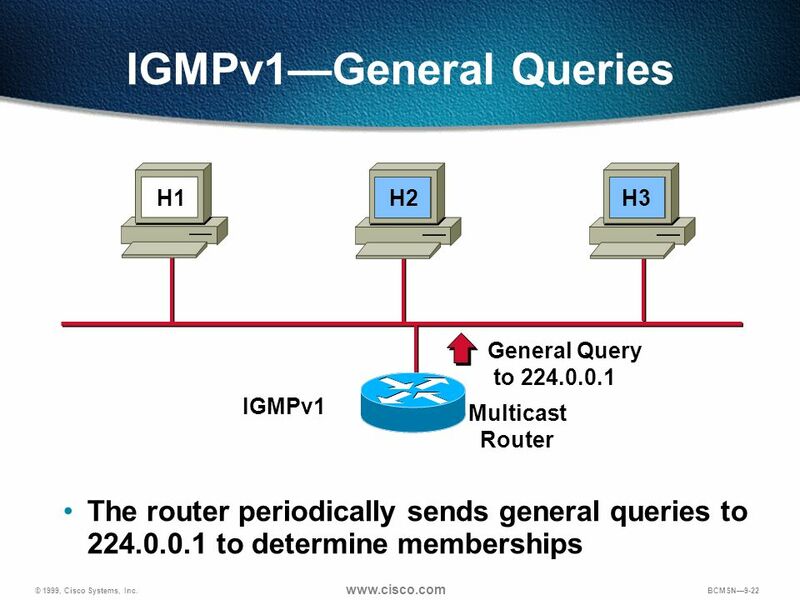 The value (in one-tenth of a second) is used by the IGMPv2 hosts as the upper bound when randomly choosing the value of their response timers this helps to control the burstiness of the responses during the query-response interval. The Group Address field is identical to the IGMPv1 version of this field with the exception that it is set to for general queries. Transition: The following continues the discussion of IGMPv2. IGMPv2 also added the concept of Group Specific Queries. 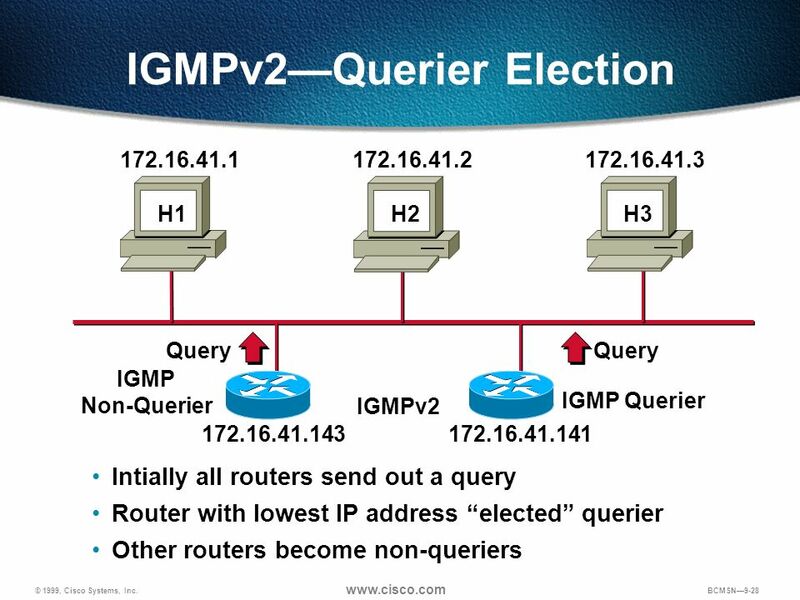 This is accomplished by sending the IGMPv2 Membership Query to the group’s multicast address, as opposed to sending to the all-hosts ( ) multicast address as is done for IGMPv2 General Queries. Membership queries are sent every 60 seconds (default). Transition: The following continues the discussion of IGMPv2. 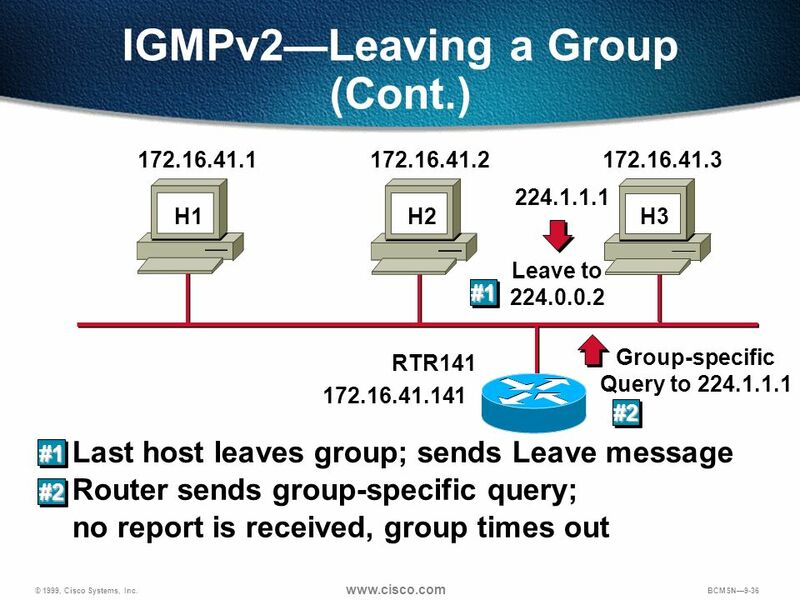 Note: Due to the wording of the current IGMPv2 draft specification, hosts may chose to NOT send leave messages if they are not the last host to leave the group. This can adversely affect CGMP performance. Example : H1 has already left this example. #1—H2 leaves. 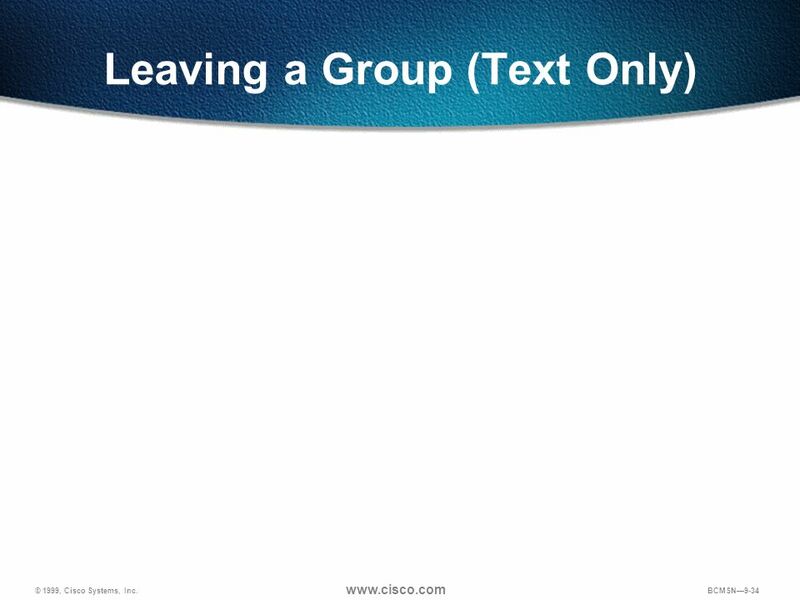 #2—Router sends group-specific query to see if any other group members are present. #3—H3 hasn’t left yet so it responds with a report message. Router keeps sending multicast for since there is > 1 member present. Transition: The following continues the discussion of IGMPv2. 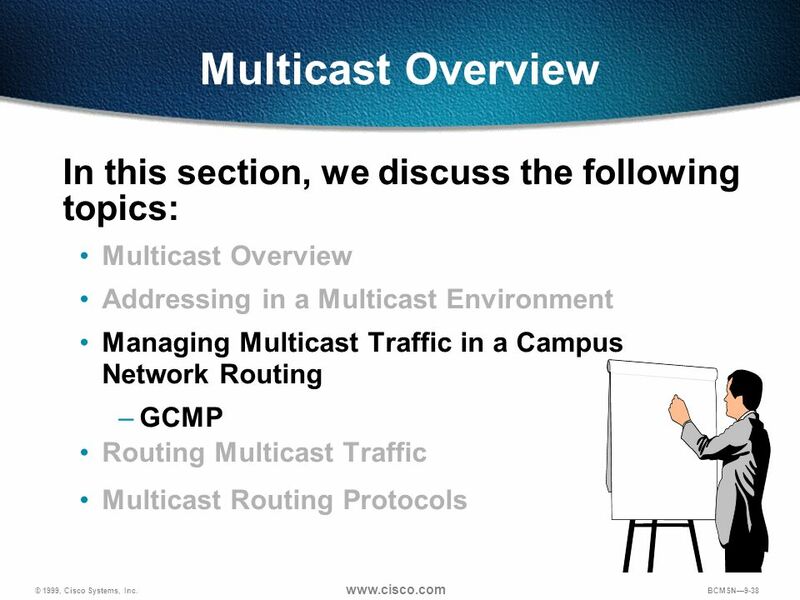 Addressing in a Multicast Environment Managing Multicast Traffic in a Campus Network Routing GCMP Routing Multicast Traffic Multicast Routing Protocols Purpose: This graphic states the section topics. Emphasize: Read or state each objective so each student has a clear understanding what is covered in this section. Transition: The following starts a discussion on CGMP. 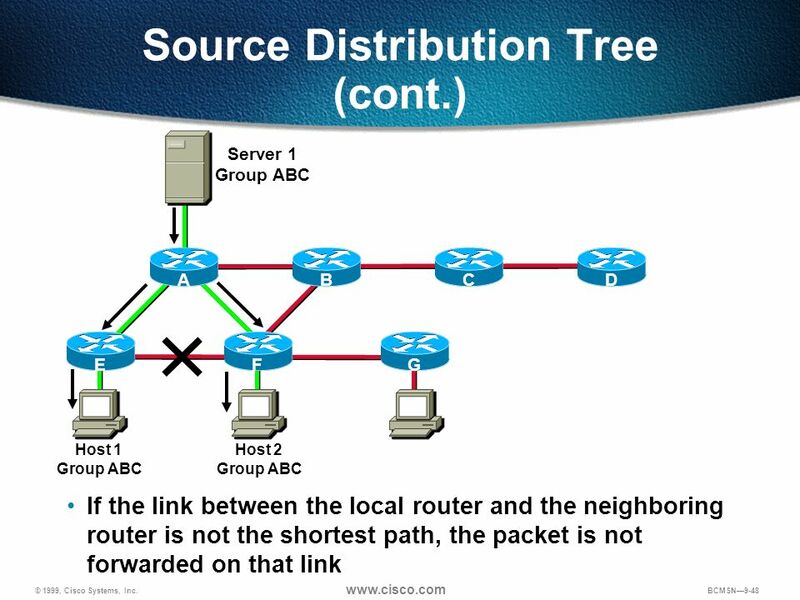 Addressing in a Multicast Environment Managing Multicast Traffic in a Campus Network Routing Multicast Traffic Routing Protocols Distribution Trees Scope of Delivery Multicast Routing Protocols Purpose: This graphic states the section topics. Emphasize: Read or state each objective so each student has a clear understanding of the module objectives. 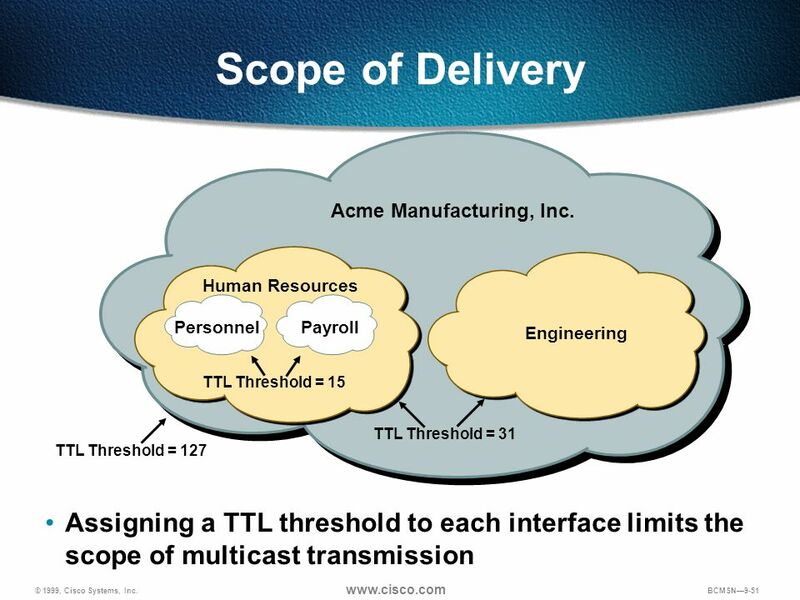 Transition: The following starts a discussion of routing in a multicast environment. 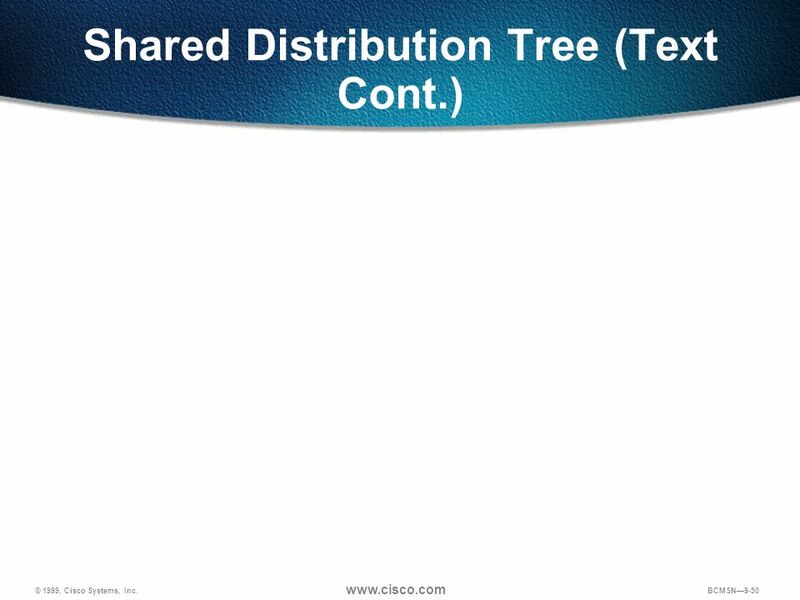 Purpose: This graphic introduces the concept of distribution trees. 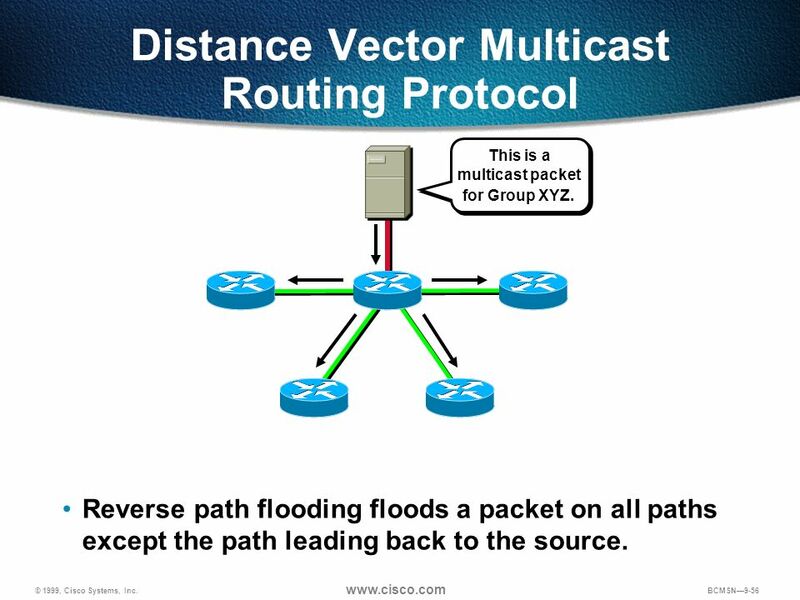 Emphasize: IP multicast traffic for a particular (source, destination group) pair is transmitted from the source to the receivers via a spanning tree that connects all the hosts in the group. 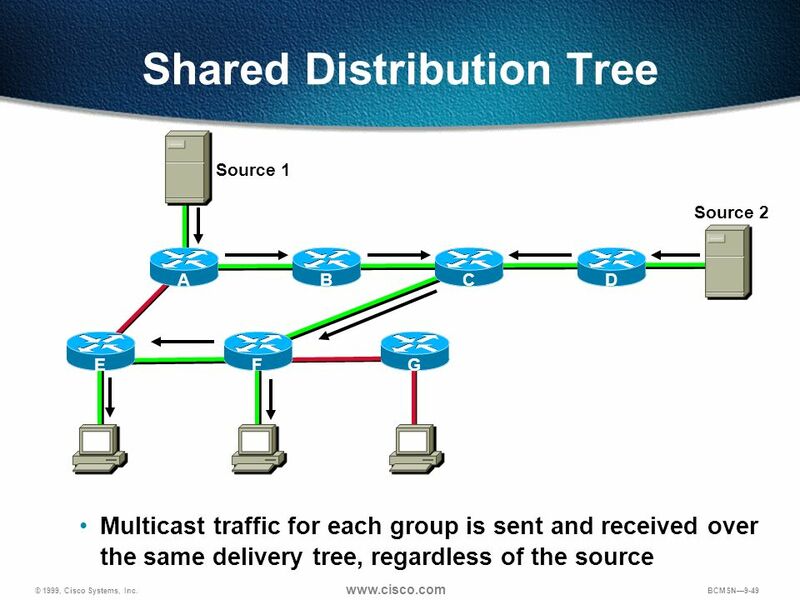 Different IP multicast routing protocols use different techniques to construct these multicast spanning trees; once a tree is constructed, all multicast traffic is distributed over it. 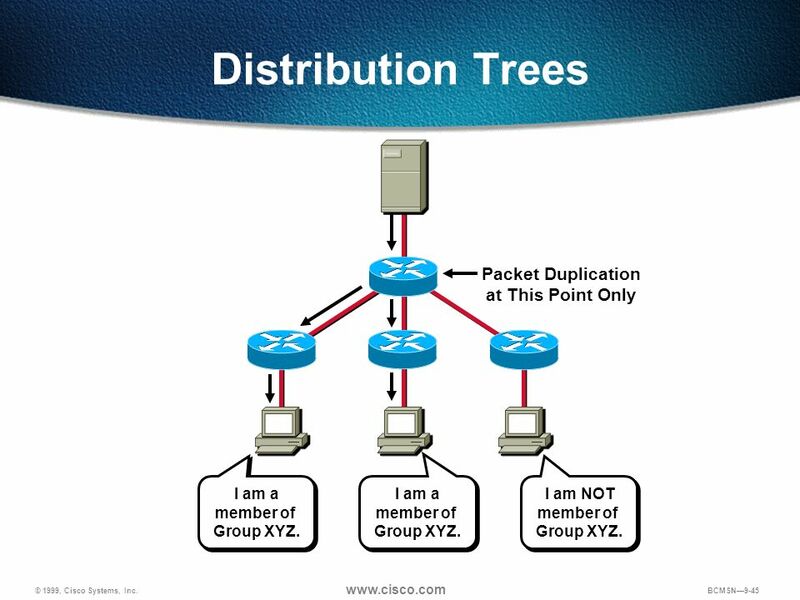 A distribution tree has just enough connectivity so that there is only one, loop-free, path between every pair of routers. Messages are replicated only when the tree branches, minimizing the number of copies of the messages transmitted through the network. Multicast groups are dynamic, with members joining or leaving a group at any time, so the distribution tree must be dynamically updated. Branches that contain new members must be added. Branches in which no listeners exist must be discarded, or pruned. I am a member of Group XYZ. I am a member of Group XYZ. I am NOT member of Group XYZ. There are two basic multicast tree construction techniques: source-specific trees and center-specific trees. Core, or source-specific, trees require finding a shortest path from the sender to each receiver, resulting in multiple minimal-delay trees for a group. Center-specific trees, or shared trees, use a distribution center(s) and construct a single multicast tree, resulting in a low overhead method, and sacrificing minimal end-to-end delay. Transition: The following is a definition of a source tree. Packet Duplication at this point only I am a member of Group XYZ. I am a member of Group XYZ. I am NOT member of Group XYZ. 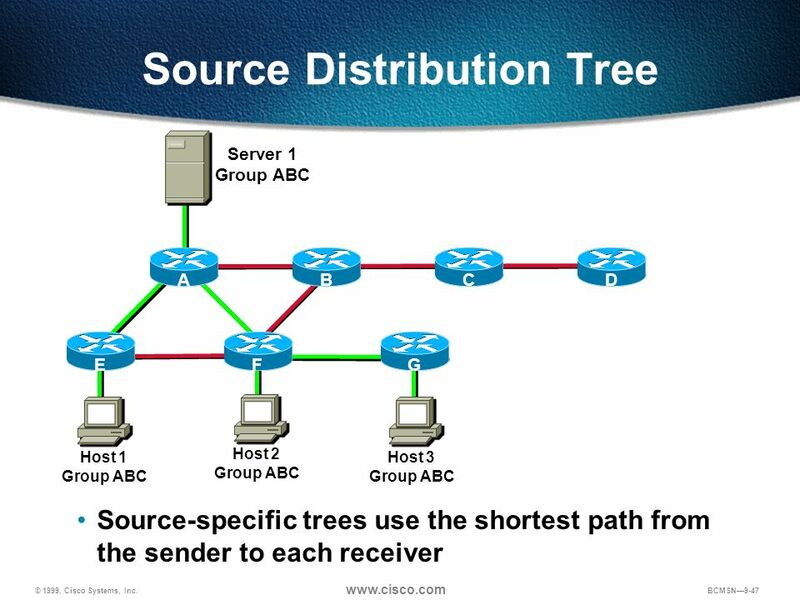 Shared trees do not maintain a path for each (source, group) pair, which improves the scalability of applications with many active senders since the number of source stations is no longer a scaling issue. 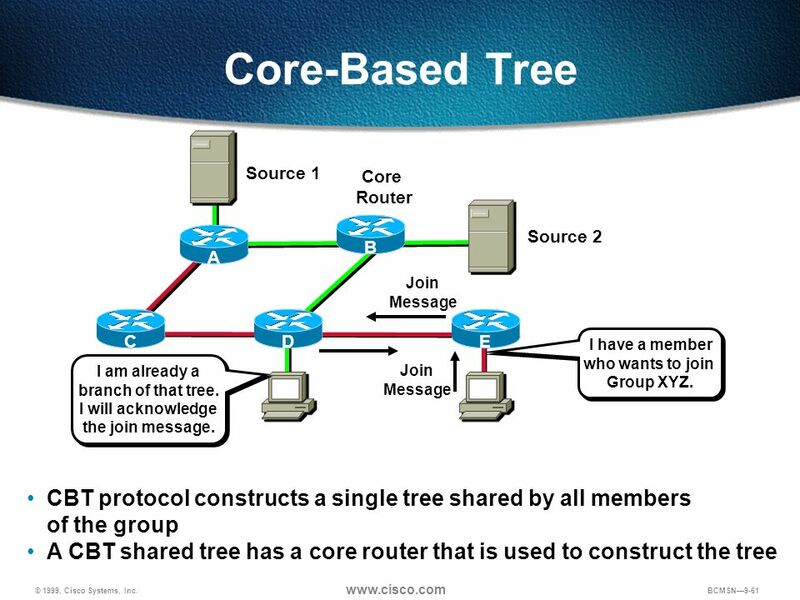 Shared-tree algorithms conserve network bandwidth since they do not require that multicast packets be periodically flooded across all multicast routers in the internetwork onto every leaf subnet. This can offer significant bandwidth savings, especially across low-bandwidth WAN links, and when receivers sparsely populate the domain of operation. Finally, since receivers are required to explicitly join the shared delivery tree, data only flows over those links that lead to active receivers. However, shared trees may result in traffic concentration and bottlenecks near core routers since traffic from all sources traverses the same set of links as it approaches the core. A single, shared delivery tree may create suboptimal routes, resulting in increased delay, which may be a critical issue for some multimedia applications. Transition: The following begins the discussion of scope of delivery. 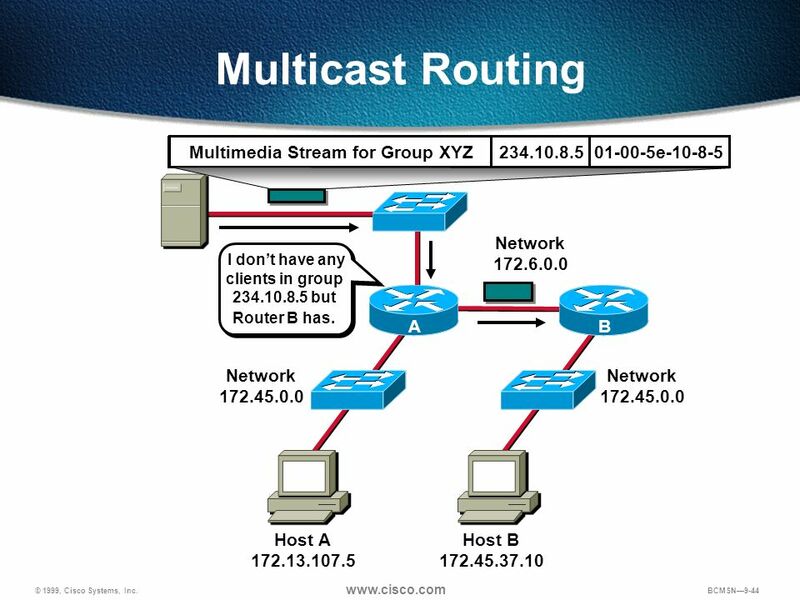 Addressing in a Multicast Environment Managing Multicast Traffic in a Campus Network Routing Multicast Traffic Multicast Routing Protocols Dense Mode Routing Protocols Sparse Mode Routing Protocols Purpose: This graphic states the section topics. Emphasize: Read or state each objective so each student has a clear understanding of what is covered in this section. Transition: The following starts a discussion of the dense-mode routing protocols. 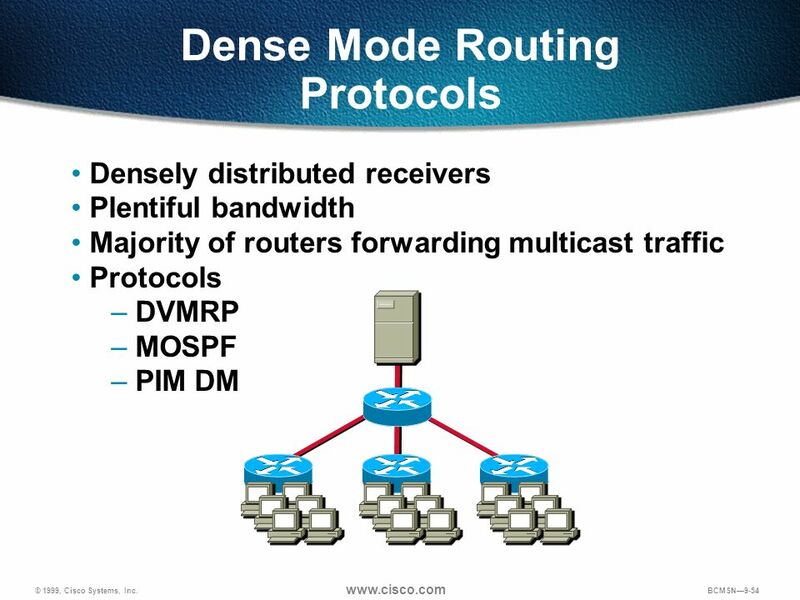 Dense-mode protocols consist of the following: Distance Vector Multicast Routing Protocol (DVMRP) Multicast Open Shortest Path First (MOSPF) Protocol Independent Multicast dense mode (PIM DM). DM protocols assume that almost all routers in the network will need to distribute multicast traffic for each multicast group. The DM protocols are most appropriate in LAN environments with densely clustered receivers and the bandwidth to tolerate flooding. Transition: The following begins the discussion of the individual routing protocols. 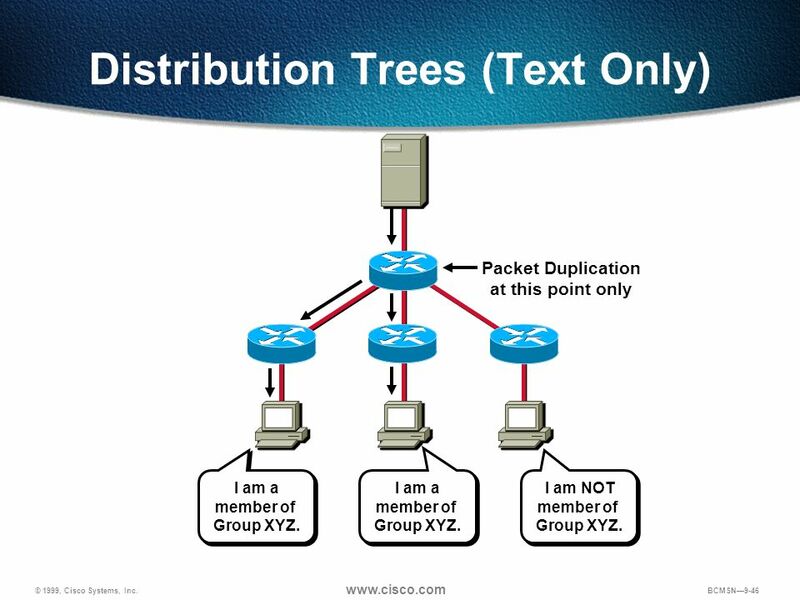 This is a multicast packet for Group XYZ. Purpose: This graphic introduces DVMRP. Emphasize: DVMRP was first defined in RFC-1075. The original specification was derived from the Routing Information Protocol (RIP) and employed the Truncated Reverse Path Broadcasting (TRPB) technique. The major difference between RIP and DVMRP is that RIP calculates the next-hop toward a destination, while DVMRP computes the previous-hop back toward a source. DVMRP now uses the Reverse Path Multicasting (RPM) algorithm. Thus, the latest implementations of DVMRP are quite different from the original RFC specification in many regards. 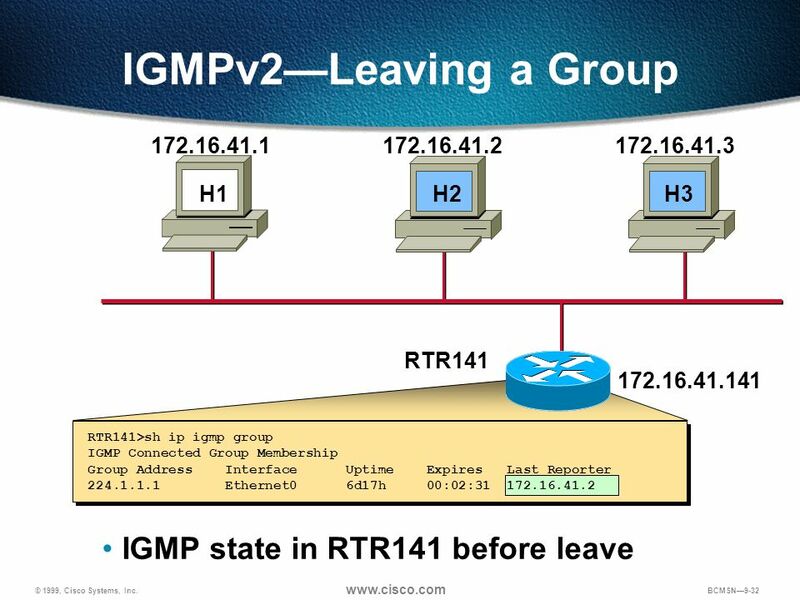 There is an active effort within the IETF Inter-Domain Multicast Routing (IDMR) working group to specify DVMRP version 3 in a standard form. 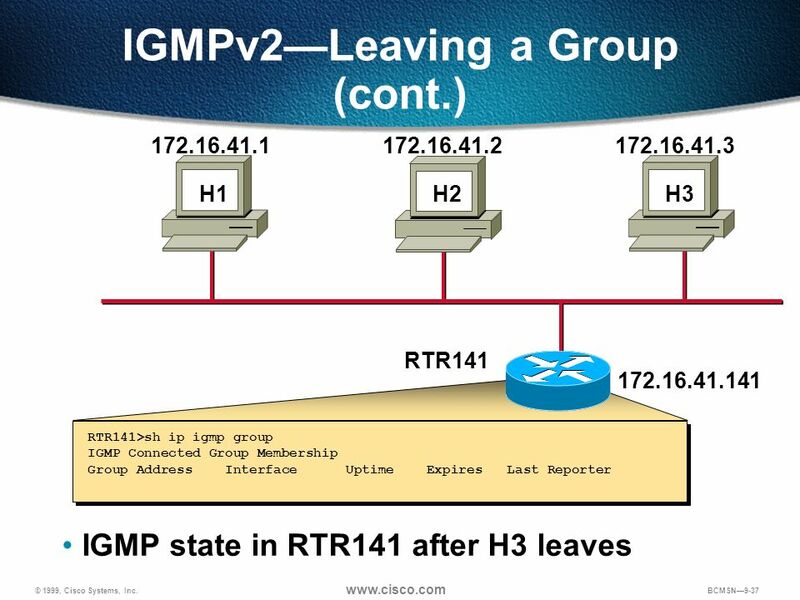 The current DVMRP v3 Internet Draft is “draft-ietf-idmr-dvmrp-v3-04.txt.” When using RPM, a router receives a packet and floods the packet out of all paths except the one that leads back to the packet source. This technique allows a data stream to reach all LANs. Transition: The following continues the discussion of multicast routing protocols. Reverse path flooding floods a packet on all paths except the path leading back to the source. 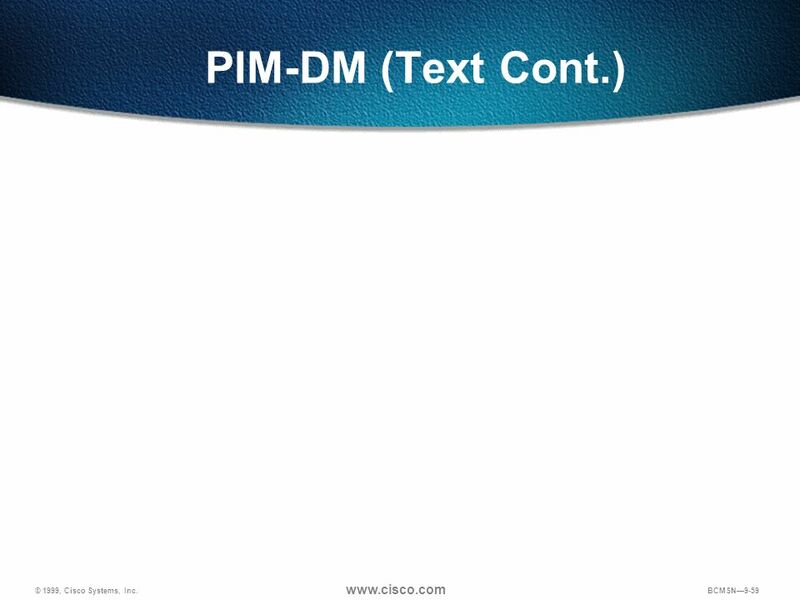 59 PIM-DM (Text Cont.) For those cases where group members suddenly appear on a pruned branch of the delivery tree, PIM DM employs graft messages to reattach the previously pruned branch to the delivery tree. 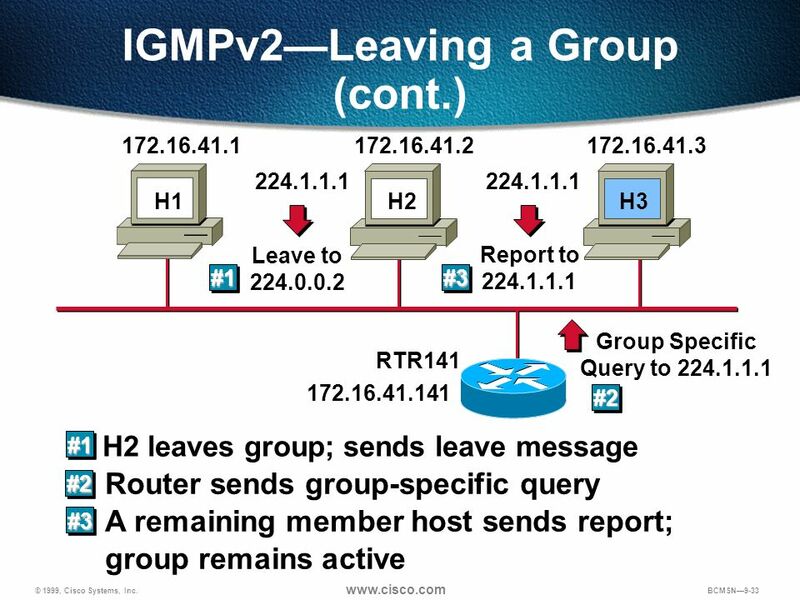 If a router that sent a prune message for a (source, group) pair discovers new group members on a leaf network, the router sends a graft message to the previous-hop router for this source. When an upstream router receives a graft message, the upstream router cancels out the previously received prune message. Graft messages cascade hop-by-hop back toward the source until they reach the nearest “live” branch point on the delivery tree. In this way, previously-pruned branches are quickly restored to a given delivery tree. 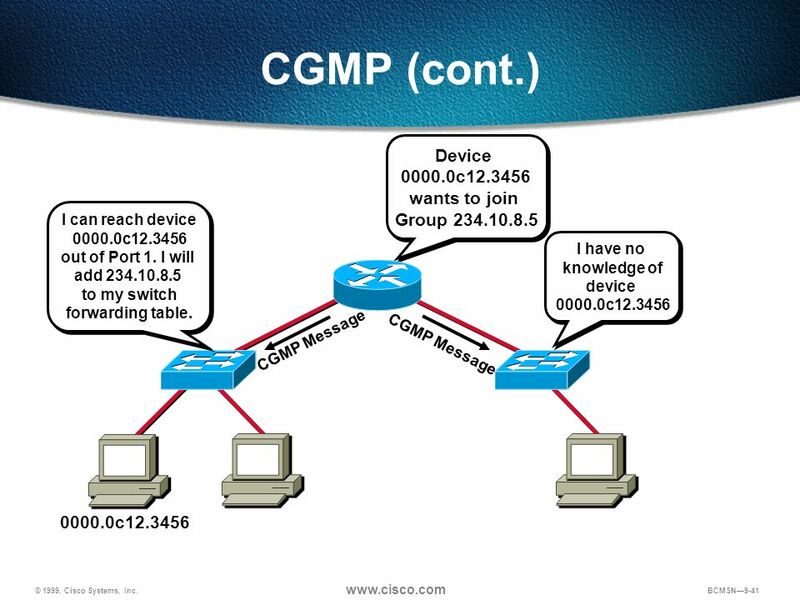 PIM DM is the routing protocol used in this course. For more information regarding PIM DM, refer to Internet Draft “draft-ietf-idmr-pim-dm-06.txt.” Transition: The following is an introduction to sparse-mode routing protocols. Sparsely distributed receivers Limited bandwidth Add branches as a result of explicit joins Protocols CBT PIM SM Purpose: This graphic introduces sparse-mode routing protocols. 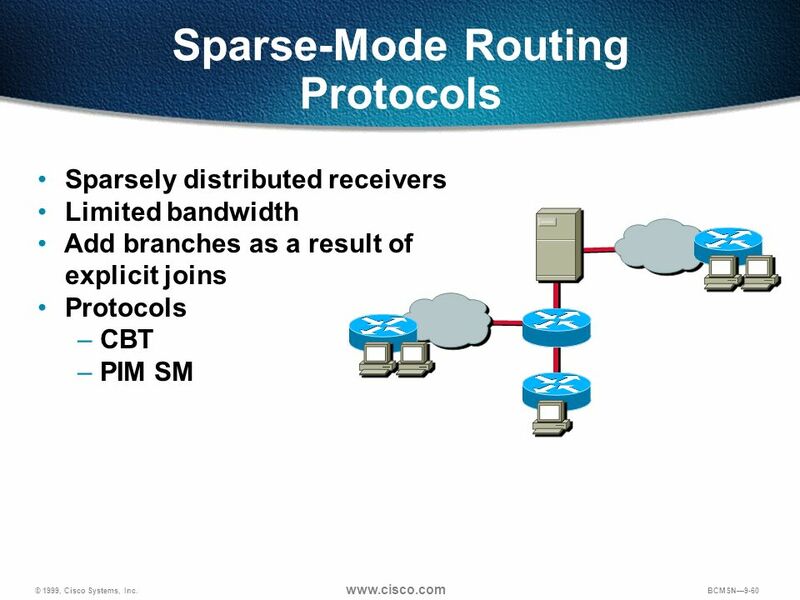 Emphasize: The most recent additions to the set of multicast routing protocols are called sparse-mode protocols. Sparse-mode routing protocols are more suited to scaling over large WANs, where bandwidth is scarce and expensive. 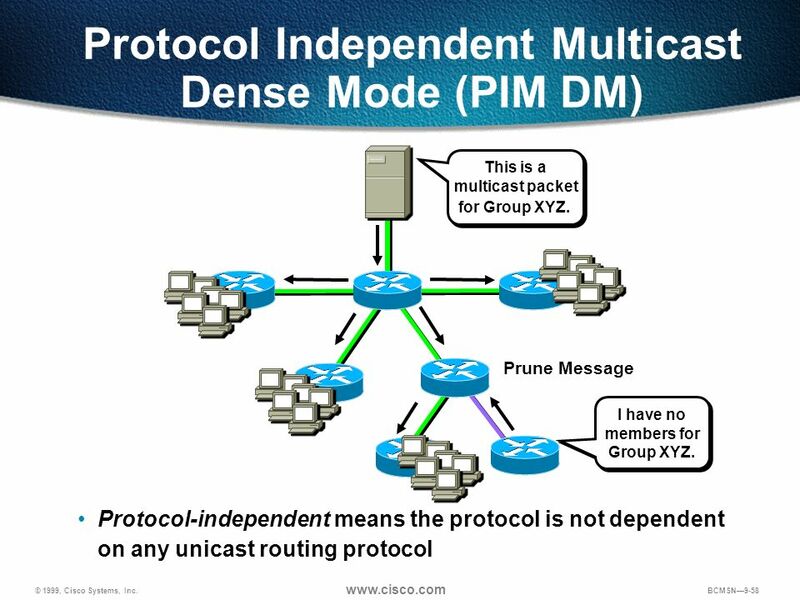 These emerging routing protocols include the following: Core-Based Trees (CBT) Protocol Independent Multicast-sparse mode (PIM SM) While these routing protocols are designed to operate efficiently over a wide-area network where bandwidth is scarce and group members may be quite sparsely distributed, this is not to imply that these protocols are only suitable for small groups. Sparse does not mean small; rather this term is meant to convey that the groups are widely dispersed, and thus it is wasteful to flood data periodically across the entire network. Transition: The following is an introduction to core-based trees. 63 PIM-SM (Text Only) A receiver must first join the group by registering with the rendezvous point. As the data stream begins to flow from sender to rendezvous point to receiver, the routers along the way optimize the path automatically to remove any unnecessary hops. However, routers continue sending to the rendezvous point, in case any new senders or receivers become active. For more information on PIM SM, consult the following documentation: draft-ietf-mboned-intro-multicast-02.txt RFC 2362: Protocol Independent Multicast Sparse Mode (PIM SM) Protocol Specification Transition: The following is the exercise for this chapter. 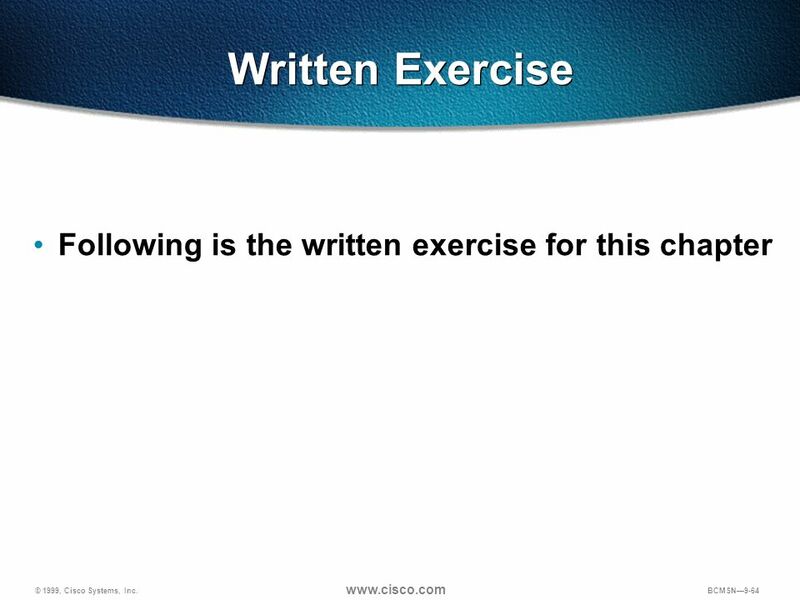 Purpose: This cues the instructor to begin the written exercise. Emphasize: Give the students enough time to complete the exercises for this chapter. Transition: The following is the summary for this chapter. 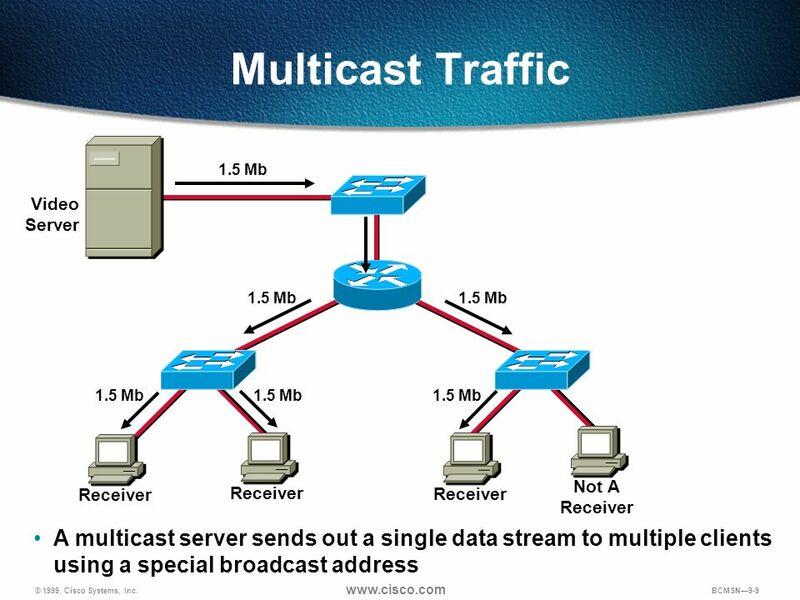 65 Summary Multicast is the most efficient method for data transmission to multiple client. 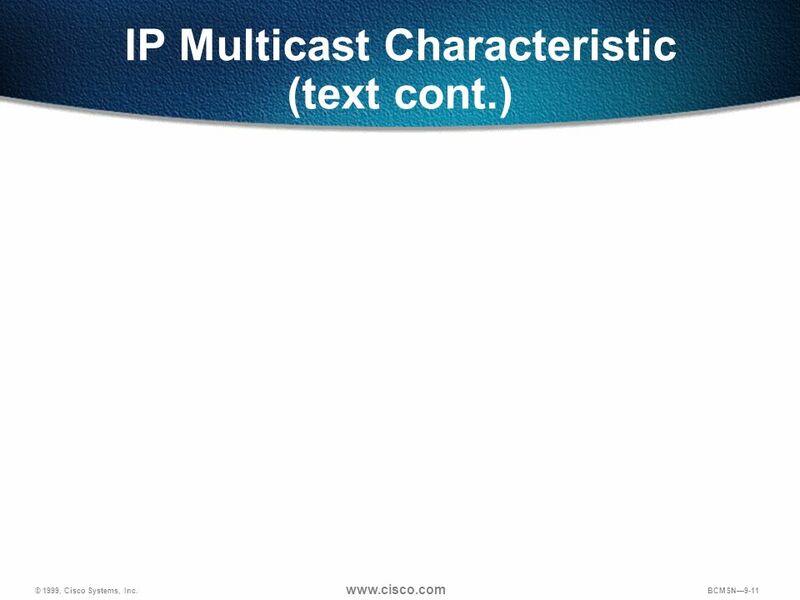 IP Multicast employs special addressing. IGMP allows clients to join and leave multicast groups. 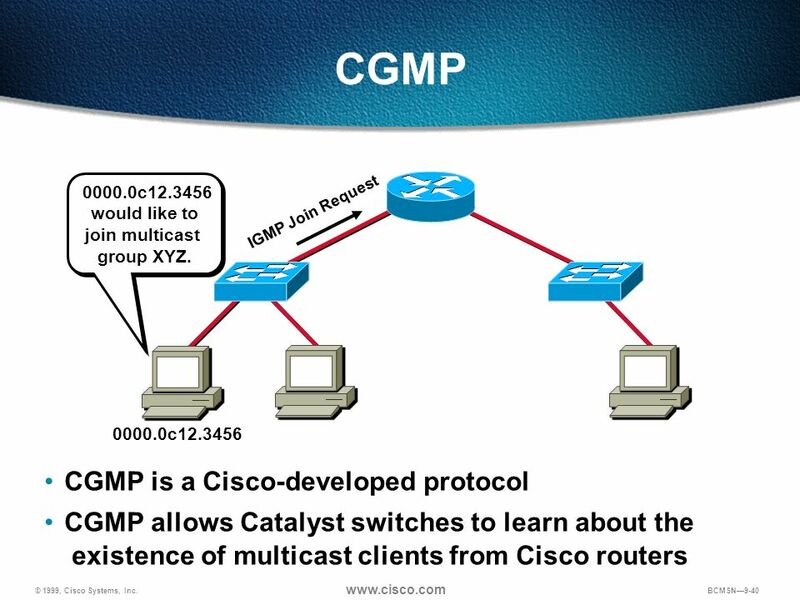 CGMP allows switches to handle multicast traffic. Special routing protocols are used to route multicast traffic through the network. 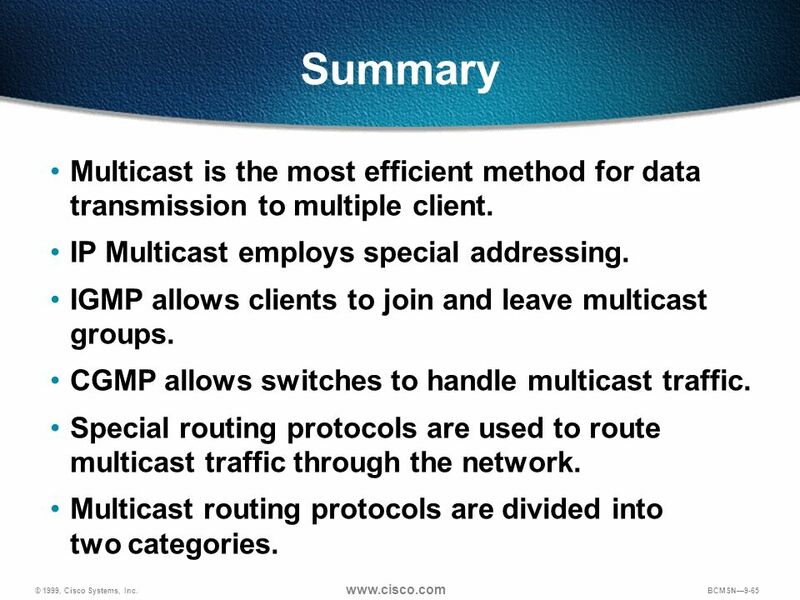 Multicast routing protocols are divided into two categories. Purpose: This page summarize what was discussed in this chapter. Transition: The following are the review questions. 66 Review Discuss the three types of transmission methods and the effect each one has on network bandwidth. Explain how routers and switches handle the impact of multicast addressing techniques. 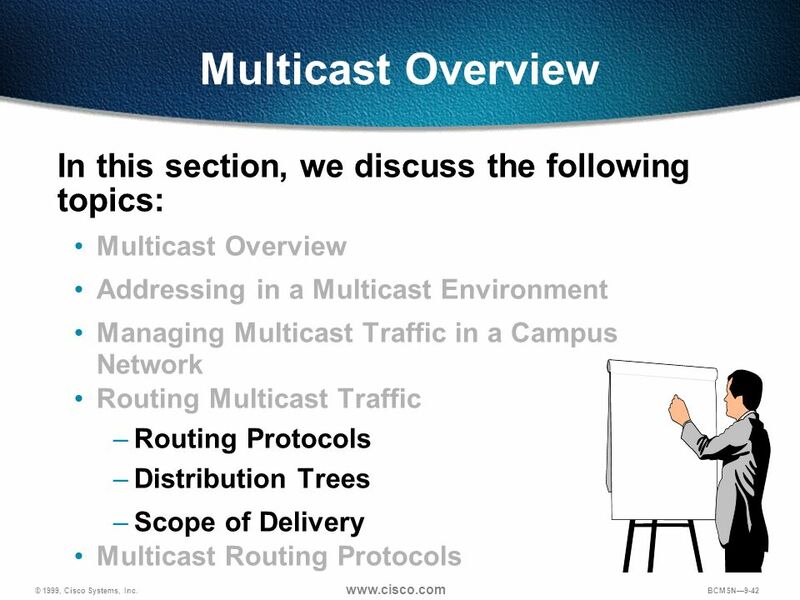 Discuss different multicast routing protocols and identify which ones are most effective in a campus network. Purpose: This page provides several topics for discussion. 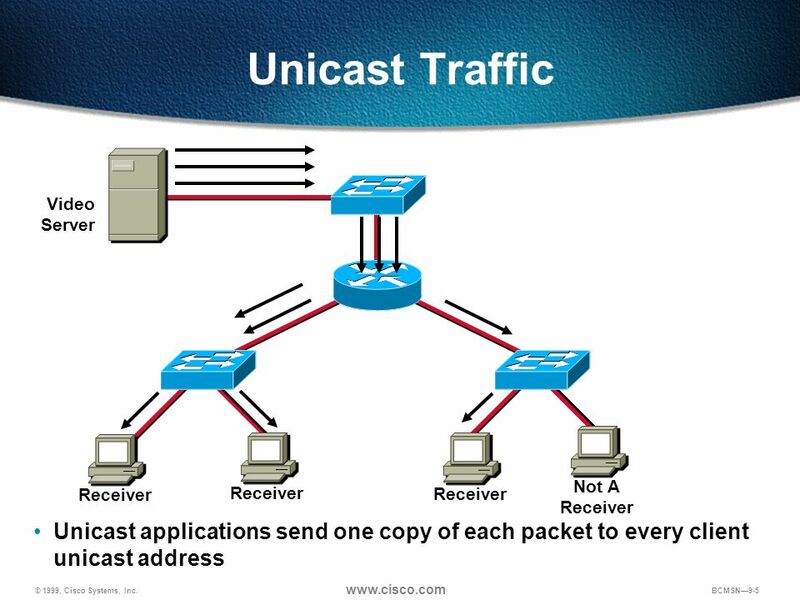 Emphasize: Points of Discussion for Review Question 1: With a unicast design, an application sends one copy of each packet to every client unicast address. Replicated unicast transmissions consume bandwidth within the network. In a broadcast design, an application sends only one copy of each packet using a broadcast address. 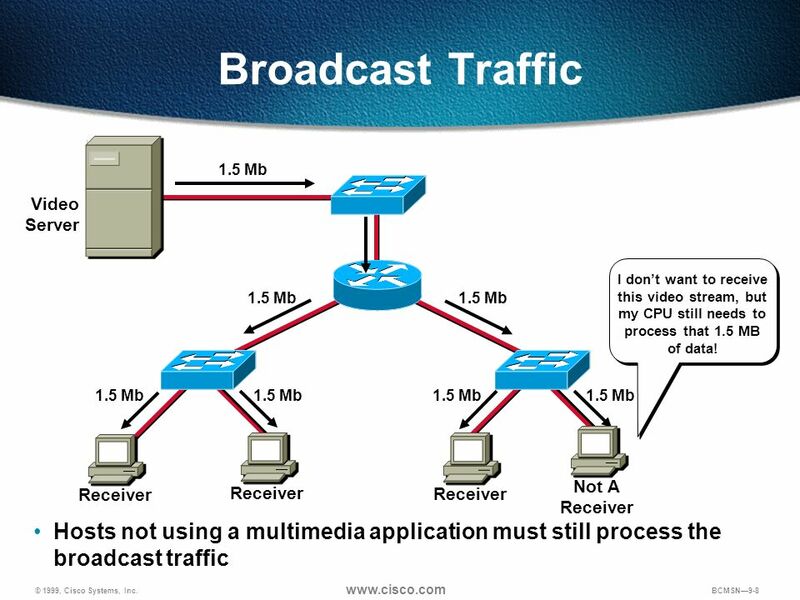 End stations not using a multimedia application must process the broadcast traffic. Multicasting sends one copy of each packet to a special address. 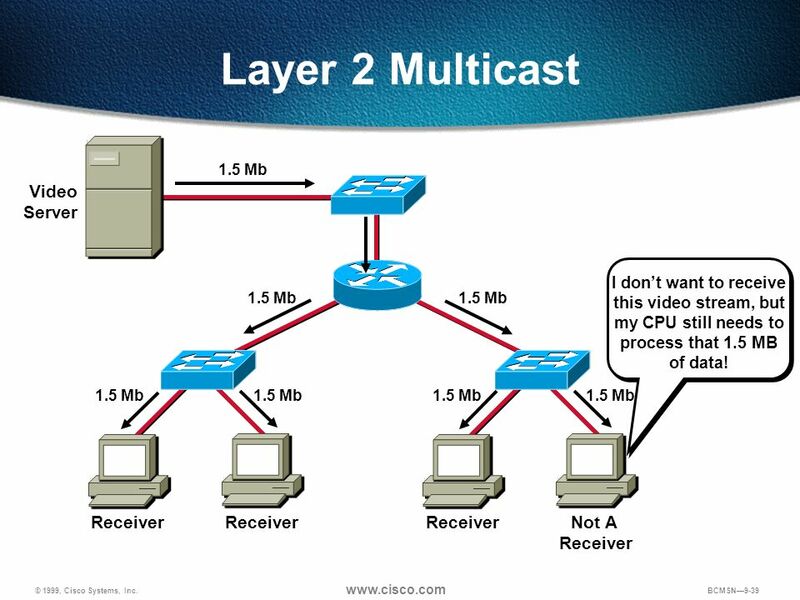 Multicasting saves bandwidth and controls network traffic by forcing the network to replicate packets only when necessary. 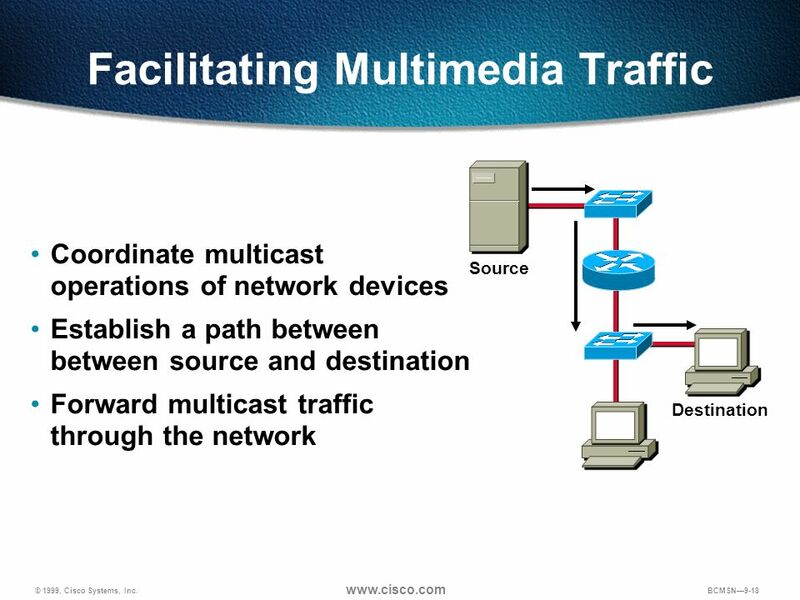 By eliminating traffic redundancy, multicasting reduces network and host processing. 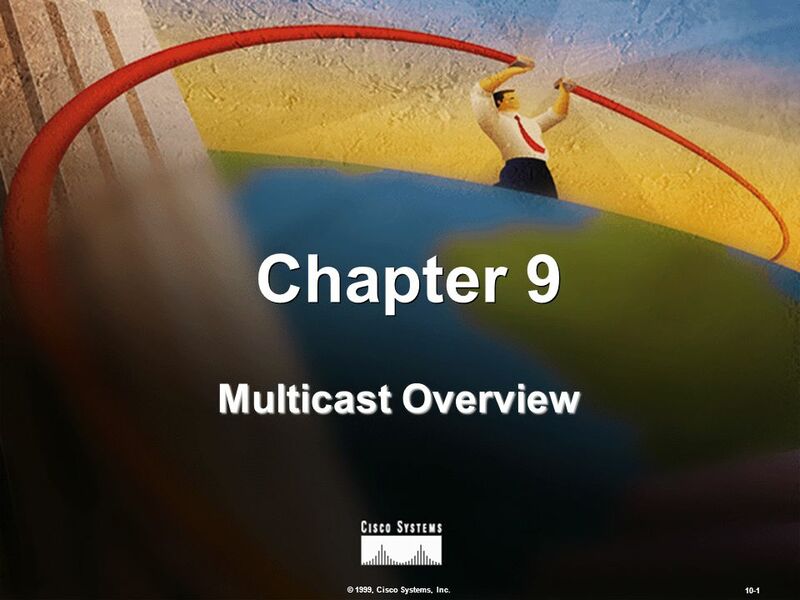 IP multicast uses Class D addresses. This multicast group ID is a single address typically written as decimal numbers in the range through The high-order bits in the first octet identify this 224-base address. The last 28 bits of a Class D address identify the multicast group ID. 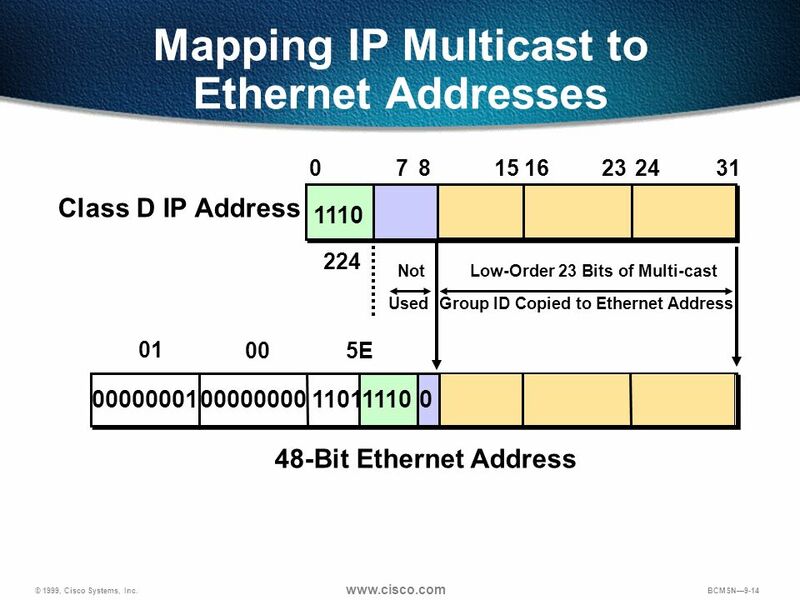 The lower 23 bits of the Class D address are mapped into a block of Ethernet addresses. 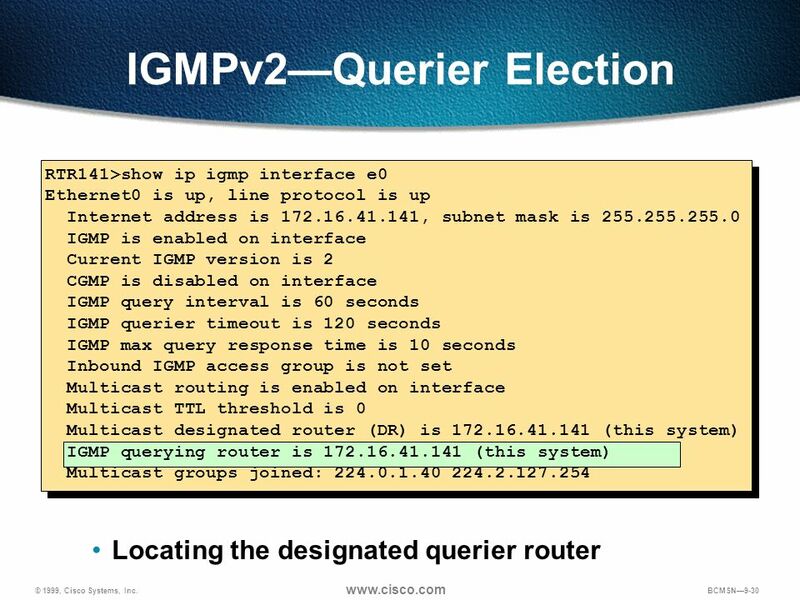 Because IP multicast groups are 28 bits long, the mapping cannot be one-to-one. Only the 23 least-significant bits of the IP multicast group are placed in the frame. The remaining 5 high-order bits are ignored, resulting in 32 different multicast groups being mapped to the same Ethernet address. There is a small chance of collisions should multiple groups happen to pick Class D addresses that map to the same MAC-layer multicast address. Usually, higher-layer protocols will let hosts interpret which packets are for the application. The chances of two different groups picking the same class D address and the same set of UDP ports is extremely unlikely. 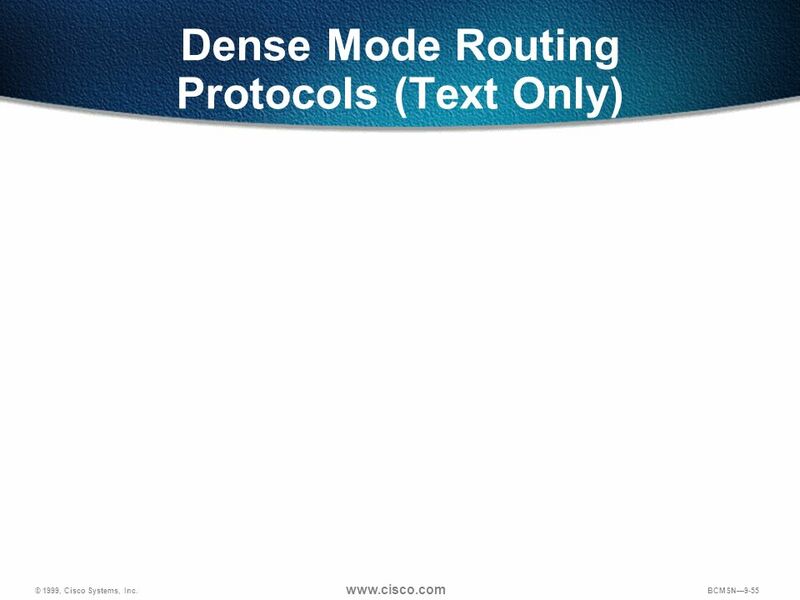 Points of Discussion for Review Question 3: Routing protocols fall into two categories: dense and sparse. 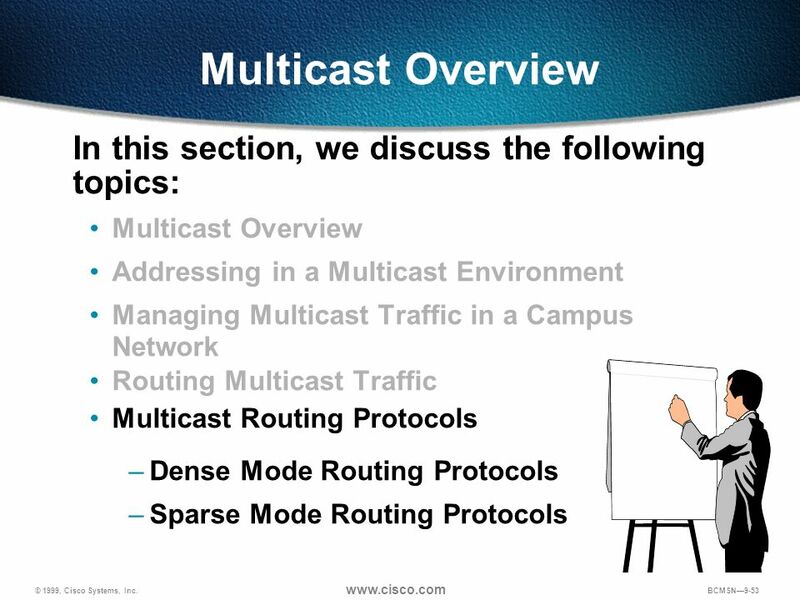 Dense-mode multicast routing protocols are designed to work well in environments that have plentiful bandwidth and where receivers are densely distributed, such as campus networks. Sparse-mode routing protocols are more suited to scaling over large WANs, where bandwidth is scarce and expensive DVMRP is widely used on the Internet multicast backbone. MOSPF is best suited for environments that have relatively few (source, group) pairs active at any given time. This protocol will work less well in environments that have many active sources, or environments that have unstable links. 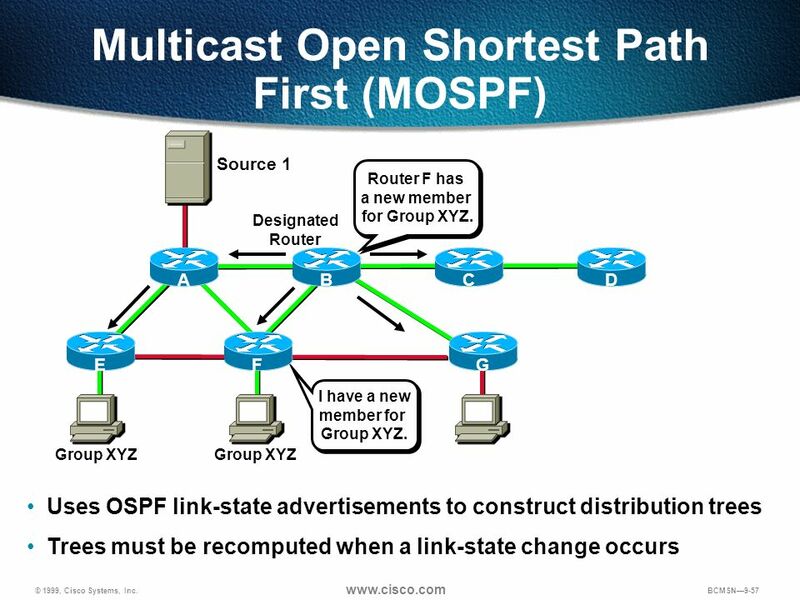 Although this is a good protocol for campus LANs, Cisco does not support MOSPF. PIM DM works best when there are numerous members belonging to each multimedia group and resources, such as bandwidth, are plentiful. This is a good routing protocol for a campus LAN. 68 Review (text cont.) Sparse-mode PIM is optimized for environments where there are many multipoint data streams. 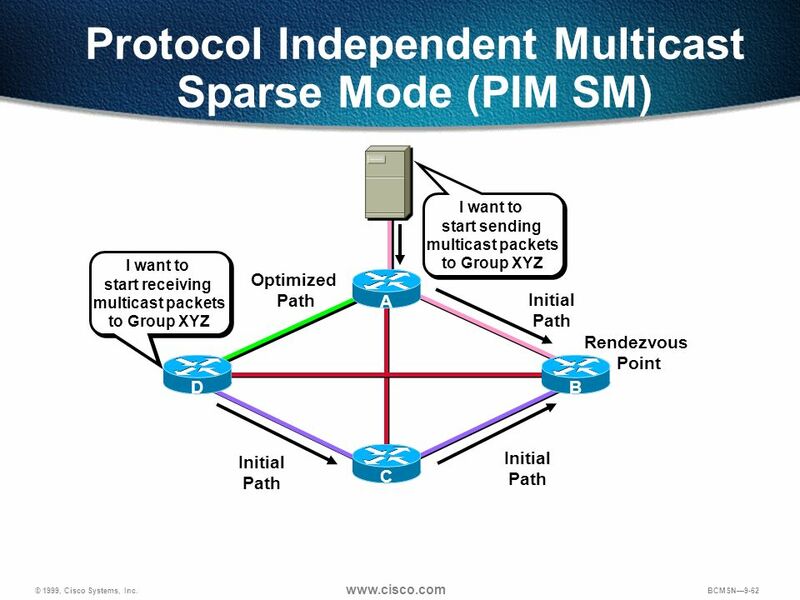 Sparse multicast is most useful when: There are few receivers in a group Senders and receivers are separated by WAN links The type of traffic is intermittent The CBT protocol is designed to operate efficiently over a wide area network where bandwidth is scarce and group members may be sparsely distributed. 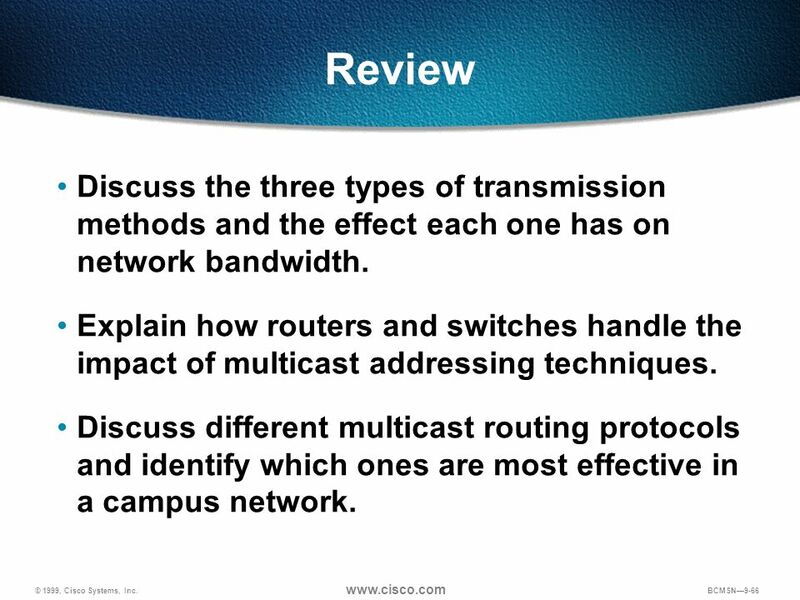 Transition: This concludes the overview of multicast concepts. Following are the chapters in how to enable and configure multicast technologies on both the router and the switch. 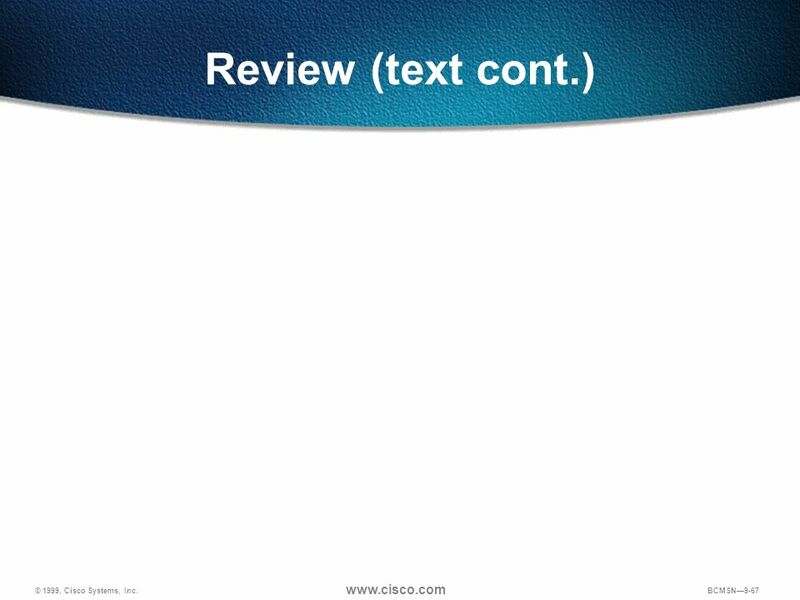 Download ppt "Controlling Campus Device Access"